Throughout Japan people love to eat. But even in the food loving country of Japan, Osaka is still known as one of the ultimate food destinations – a city with passionate food lovers and an abundance of things to eat. 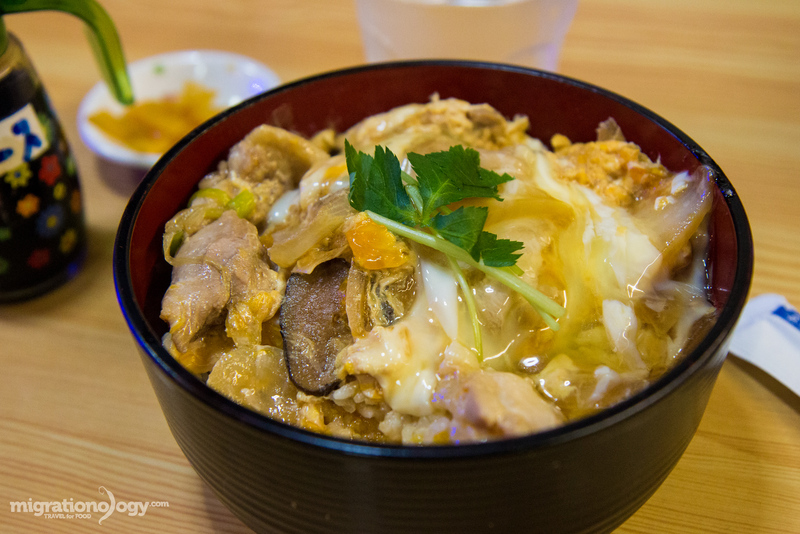 And that’s precisely the reason why I was so excited to visit Osaka, Japan – for the food. In this Osaka food guide blog, I’m going to share with you 11 Japanese foods to try in Osaka, and then share restaurants where you can try them. NOTE: Before we get started on this food guide, just remember that Osaka is a big city in Japan, and just about all the best Japanese foods from around the country are available. But I’ve narrowed in on 11 of the dishes in Osaka that I think are some of the most important and local favorites. Also, a big thank you to Dwight Turner who is responsible for encouraging Ying and I to come to Osaka on an impulse decision. Go check out his blog here. 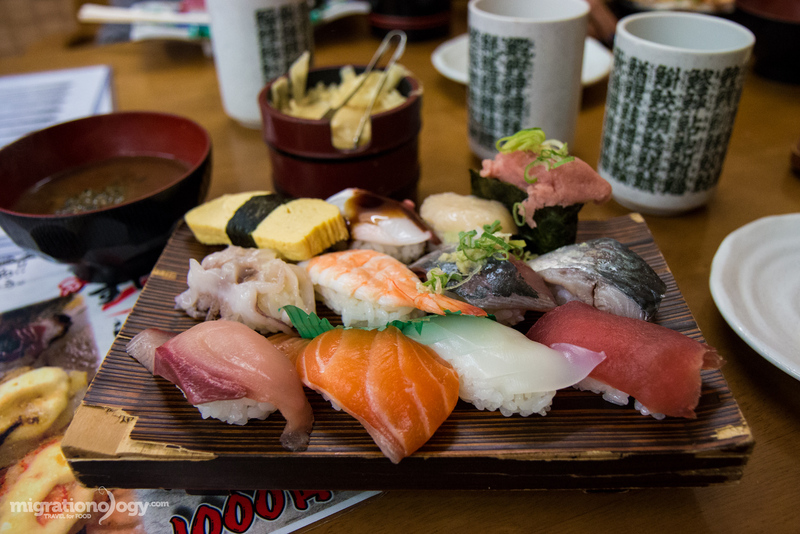 I know, this could seem a bit obvious, but to me, I had to include sushi and sashimi in this Osaka food guide because I believe it is the most important food in all of Japan. 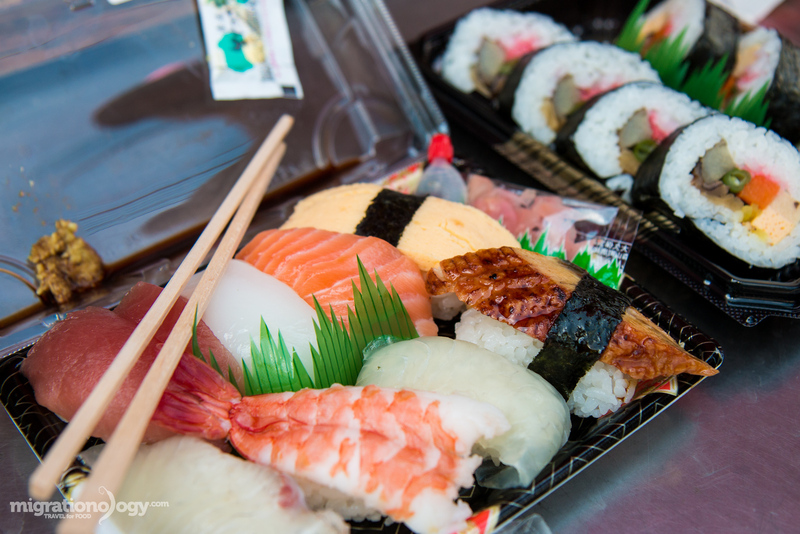 While many of the Japanese foods mentioned on this list below are available at Japanese restaurants throughout the world (as are sushi and sashimi), the freshness and quality of sushi and sashimi in Japan is unparalleled. Even though you could eat sushi somewhere else in the world, to me it’s the ONE food worth flying to Japan just to eat. You might also be interested in my Tokyo food guide. 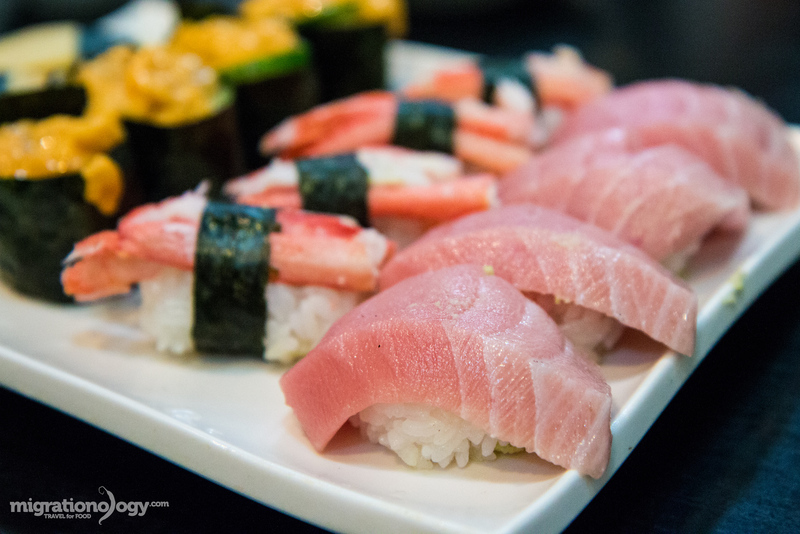 The simplicity, the freshness, and the presentation, are all factors that contribute to eating sushi in Japan and make it such a glorious food experience. Osaka is home to one of the largest fish markets in Japan, with a lively tuna auction that goes down early in the morning to get the sushi and sashimi started for the day. 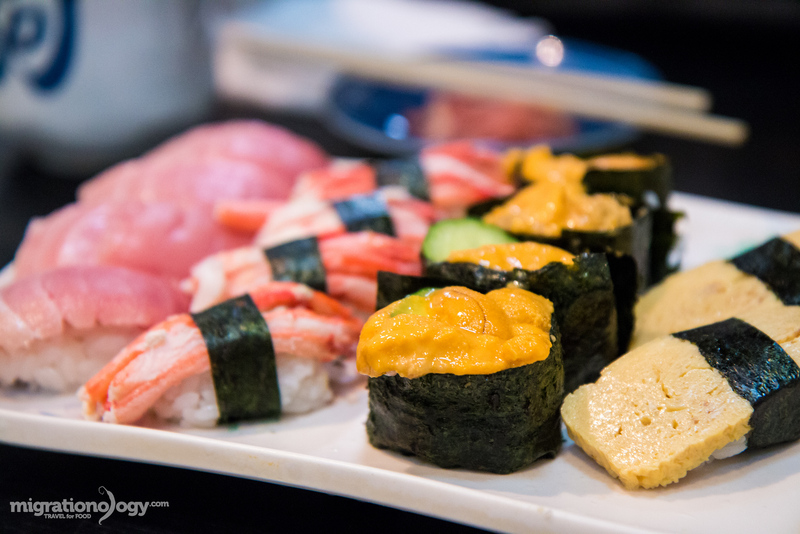 Sushi and sashimi are available throughout Osaka, from supermarkets and budget stalls to the highest end sushi restaurants, and everything in-between. I was pretty happy with how affordable sushi was – for less than $10 you can eat a world-class sushi meal in Osaka, a plate of sushi that could easily cost $20 – $30 outside of Japan. In addition to normal nigiri sushi that includes a ball of rice and a slice of fish on the top, Osaka is also famous for its old style box sushi, known as hako-zushi, and available at markets through Osaka, the basements of departments stores, and a famous restaurant called Yoshino Zushi. 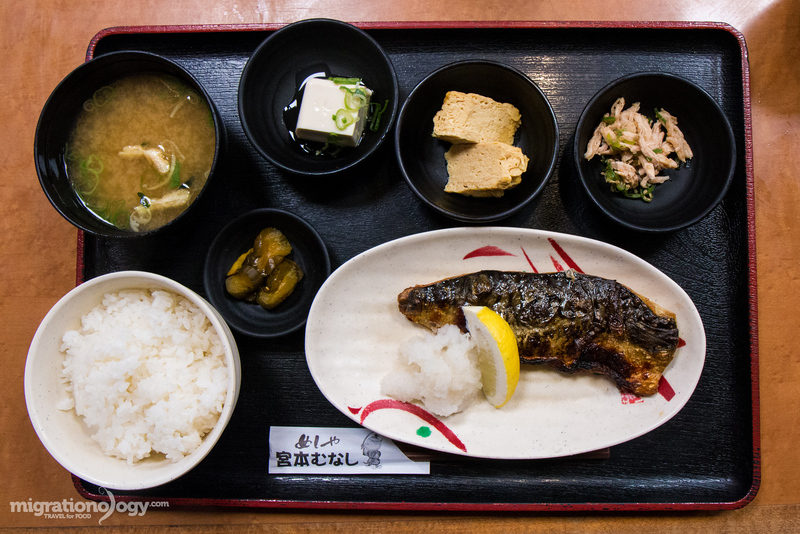 After exploring the Kuromon Ichiba Market one afternoon, we wanted to sit down for a more substantial meal. A quick search on Foursquare lead us to Tokisushi (ときすし), a small and friendly sushi bar, where they serve some seriously good sushi. I ordered the 12 piece set, which included 12 different pieces of nigiri sushi, all picked by the chef, which probably changes by the day depending on what fish and seafood is available. Everything on my plate of sushi was excellent, but the negitoro, minced fatty tuna sitting over a bite of rice wrapped in fresh seaweed, was my ultimate piece. And along with serving awesome sushi, their service was excellent, and all the staff were friendly and helpful. Of all the restaurants in this Osaka food guide, this place is one of my favorites. 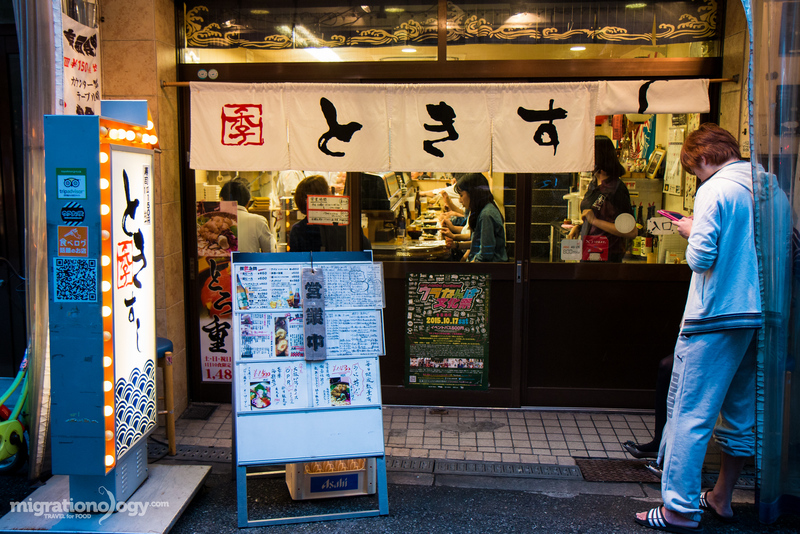 Located somewhere in the middle of Japan’s longest shopping street (Tenjinbashisuji Shotengai – try to pronounce this one), Harukoma Sushi (春駒 支店) is popular sushi restaurant in Osaka, and I absolutely loved it. We arrived at about 5 pm, and had to wait in line for around 15 minutes to get in, but the line moved quickly for how many people were waiting. From outside, the restaurant looked quite small and calm, but inside it was large, with about 10 sushi chefs, and it was loud and energetic – it felt like I was at the fish market – a fantastic sushi dining environment. They had an English menu, and the ordering was done in a-la carte fashion. I wrote down all the different types of sushi and rolls I wanted, handed it to our kind waitress, and within minutes our platter of sushi arrived. Don’t go to Harukoma Sushi (春駒 支店) looking for delicate, extremely beautiful sushi (the kind that won’t make you full). Instead, go there for generous slices of thick cut fresh fish. It’s the type of sushi restaurant you eat at when you want to get full with great quality. I could hardly believe how big they cut the tuna belly and the quality and quantity of their uni (sea urchin). One of the best restaurants in Osaka for me. And again, just like at so many of the restaurants included in this Osaka food guide, the staff at Harukoma Sushi (春駒 支店) were helpful and really kind. There are two branches of this sushi restaurant within the same market, both with a continual line of customers waiting to get in. I ate at the larger branch, on the main market walking street. How to get there: It’s not too far from either Temma JR station or Ogimachi Subway Station, along Tenjinbashisuji Shotengai walking street. Around popular shopping districts like Namba and Umeda you’ll find plenty of budget sushi restaurants in Osaka that serve sushi that rotates around the restaurant on a conveyor belt. 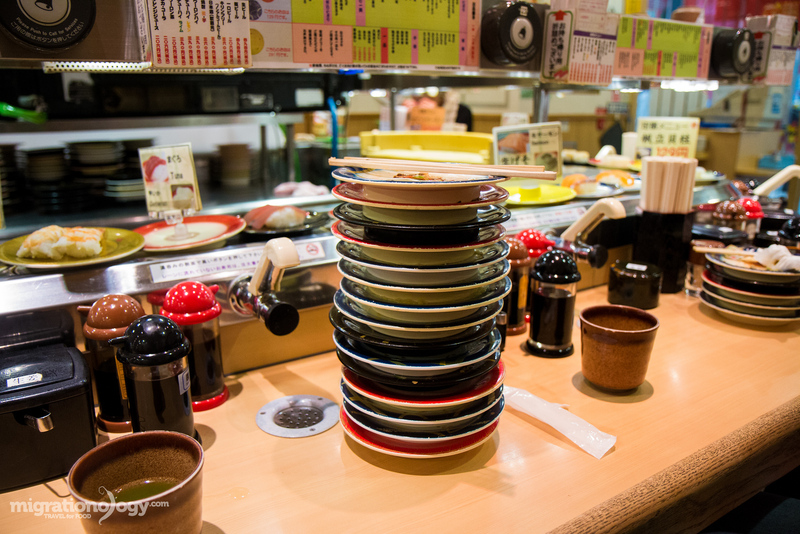 Conveyor belt sushi restaurants often have a clear system of different colored plates that cost different amounts, and often their cheapest plates will be in the 100 – 130 JPY per plate range. While it can’t compare to the quality at a real sushi restaurant, I quite enjoy conveyor belt sushi for the food and the atmosphere. I think Japanese mainly eat conveyor belt sushi when they want a budget meal in Osaka that they can eat quickly. Do any searches for the best sushi in Osaka, and you’ll quickly come up with Endo Sushi, a famous restaurant located at the Osaka fish market. I made the mistake of going on a holiday, and they were closed. So unfortunately, no Endo Sushi for me on my latest trip to Osaka. 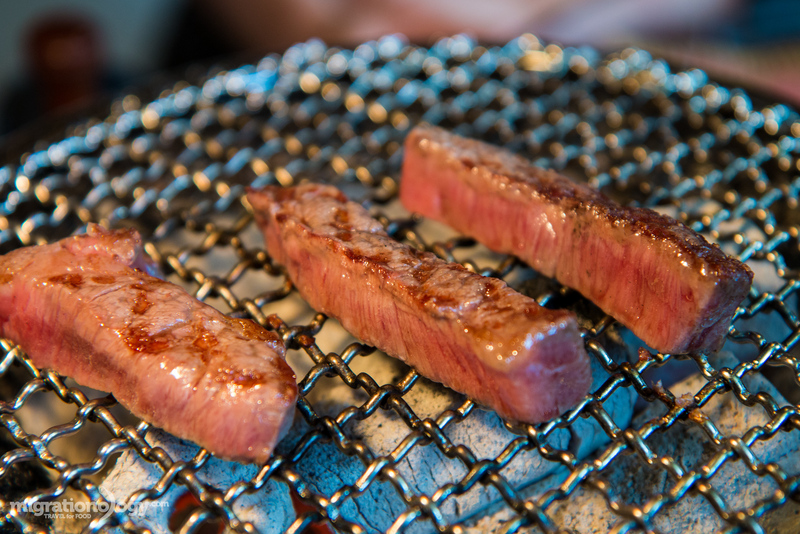 It’s not only fish and seafood that Japan excels at serving, but grilled Japanese beef and meat is another meal you don’t want to miss when you’re in Osaka. For just about any meat lover, Japanese beef is the holy grail of meat – it’s the type of beef that you’ll have dreams about. Yakiniku is the Japanese style of grilling beef, typically where you grill the meat yourself on a tabletop charcoal grill in the middle of your table. Before we get into the meat, I just want to touch on the fact that even though you’re eating indoors, you’ll likely get real charcoal to cook your meat over, not a gas powered grill – and this makes so much difference in flavor. 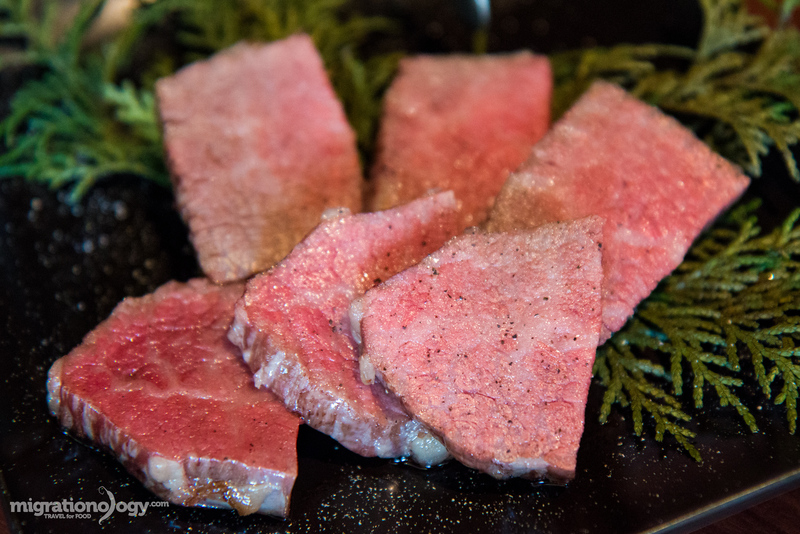 When you go to a yakiniku restaurant and see the different selection of Japanese beef available on the menu, you’ll start drooling just from the raw meat photos. Do you like my photos? Check out the camera gear I use here. Japanese beef – look at that marbling! 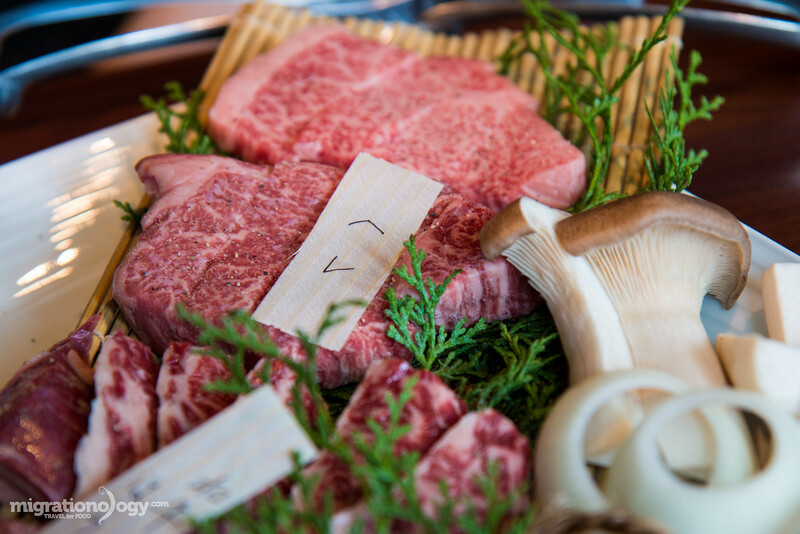 Kobe beef, one of the world’s most famous meats, is a type of Japanese wagyu from Kobe, which is located just a 30 minute train ride from Osaka – so Osaka has plenty of Kobe beef available. But there’s not just Kobe wagyu beef, there’s also Matsuzaka beef, which some consider superior to Kobe beef, and there are varying levels of Japanese wagyu beef as well. 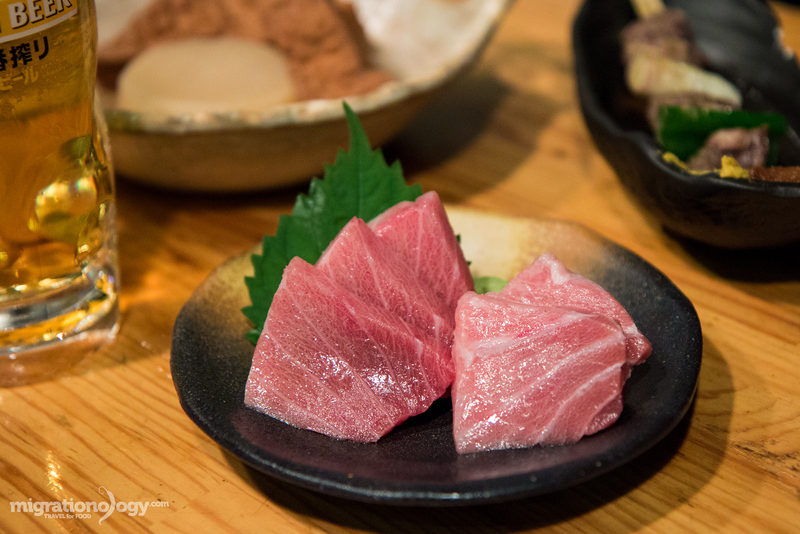 For yakiniku, the meat is sliced into bite sized pieces, grilled over charcoal, and often served with just a few light seasoning like high quality salt, sesame oil, shoyu, and sometimes a dab of sweet wasabi. But the meat is so flavorful and juicy, it honestly needs little, if any help. While you’ll often seen the advertising for the most beautiful marbled slices of wagyu, another popular yakiniku meal is known as horumon bbq, the random bits of meat like stomach and esophagus. If you’re ready to take on some parts of the cow that you didn’t even know were possible to eat, a horumon experience is something you can’t miss in Osaka. There are plenty of Yakiniku restaurants in Osaka like Susumu and Matsuzakagyu, but since Kobe is so close to Osaka, it’s also fun to take a day trip to Kobe for some beef as well. Through a friend of a friend, Dwight connected with Lauralee. Along with being extremely kind and agreeing to take us on a food tour of Kobe, her and her husband own a couple of yakiniku restaurants, and invited us to sample some beef. When our train arrived to Kobe, we met up with Lauralee and her husband, who drove us out to La Shomon (焼肉バル), one of their beef restaurants located in the Tarumi area of Kobe. The raw beef came on a plate, beautifully decorated, and when I saw the veins of fatty marbling in the meat we were about to grill, I almost couldn’t handle my anticipation. This was the best beef meal of my life. The meat was unbelievably juicy and had a depth of flavor that I’ll never forget. In addition to the best beef I’ve ever had, La Shomon (焼肉バル) also specializes in dry aged Japanese wagyu. The meat was grilled in a block, then sliced into bite sized pieces. Again, it was outrageous, with a hint of a cheese flavor to complement the intensely good beef. La Shomon isn’t in Osaka, but it’s worth making the trip to Kobe (Tarumi) for. How to get there: La Shomon is about a 20 minute train ride from central Kobe, in an area called Tarumi. You can get off the train at Tarumi station, and the restaurant is very close, at the base of the walking street. 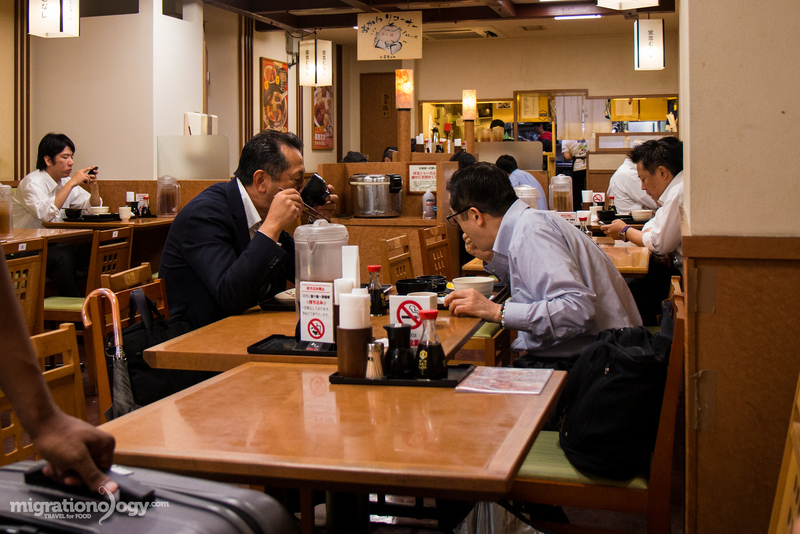 In Osaka (and throughout Japan), people take their ramen very seriously. 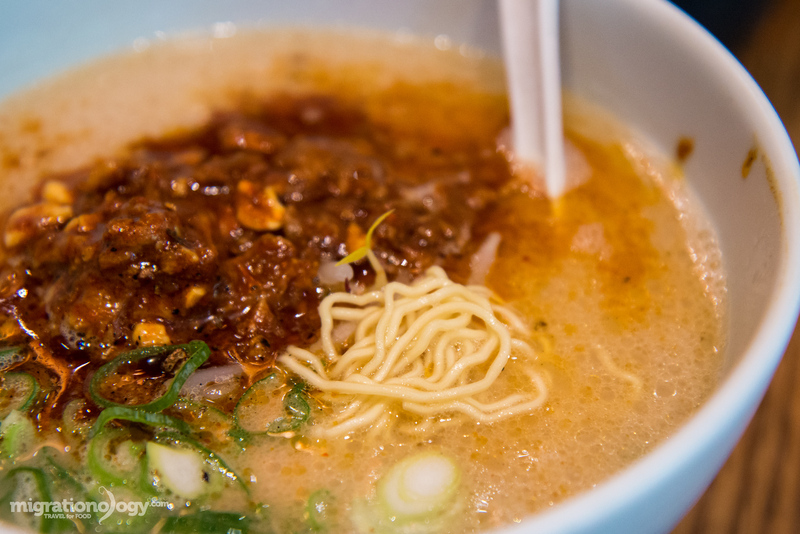 It’s a dish, that at the right restaurant, many are willing to stand in a long line to patiently wait their turn to have a bowl of piping hot noodles in broth. Ramen is one of those dishes in Japan that has a cult following – everyone has their favorite spot, and when you want to eat a bowl of ramen, nothing can deter your craving. 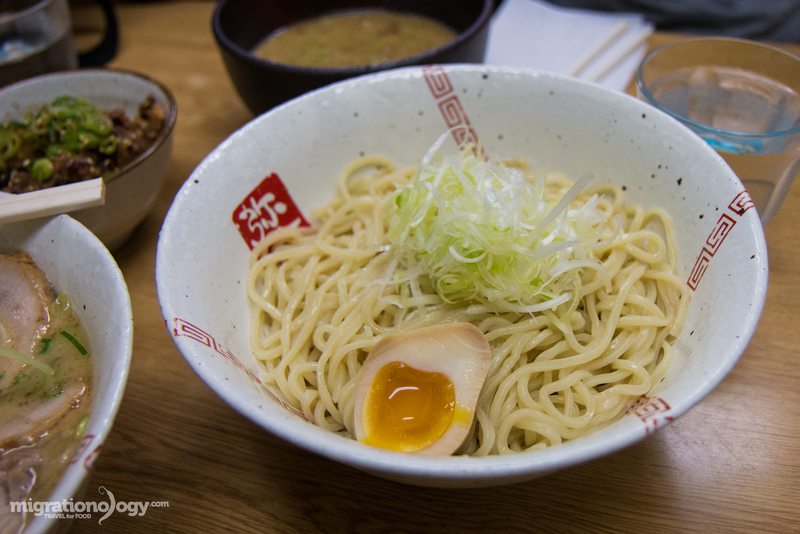 The noodles used in ramen are typically wheat noodles, similar to Chinese lamian. 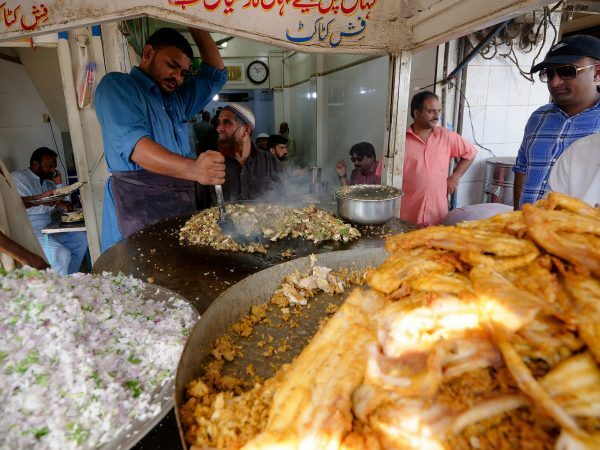 They are cooked to varying degrees of chewiness, sometimes served more al-dente, while other times they are served softer. But the real flavor and pleasure of eating a bowl of ramen (at least for me) is in the broth, and there are a number of different popular styles, which can be identified by the richness and flavor of the broth. This is a great explanation of the different types of ramen you’ll find in Japan, but a few of my favorites are shio, a salt based broth, shoyu, a soy sauce based broth, and finally, the heavy creamy tonkotsu ramen, made with pork bones that are boiled until the marrow is unleashed. Finally, the toppings, and most notably, the thick slices of pork chashu, and the spoonful of raw minced garlic, elevates a bowl of ramen to perfection. For myself, it depends on what mood I’m in that determines what styles of ramen I feel like eating. But a good bowl of rich buttery tonkotsu is tough to beat. I can say with some certainty, that my bowl of chicken based shoyu ramen at Ramen Yashichi (らーめん弥七) in Osaka, was the best bowl of ramen I’d ever had… in fact, I didn’t even know ramen could be this good before Dwight took me here for the first time. As with many ramen restaurants in Japan, you have to pay at a vending machine, and then get a ticket that corresponds to your bowl of ramen of choice. You then proceed to hand it to the chef as you sit down. Ramen Yashichi (らーめん弥七) is a small restaurant, but they maintain a quality and flavor of ramen that blew me away. The broth is technically shoyu, but it’s heavy and buttery, and perfectly salty and creamy, with both slices of chashu and a scoop of fragrant wok fried pork, to make the flavor even better. All in all, it was a beautiful bowl of ramen, definitely worth waiting in line to eat. 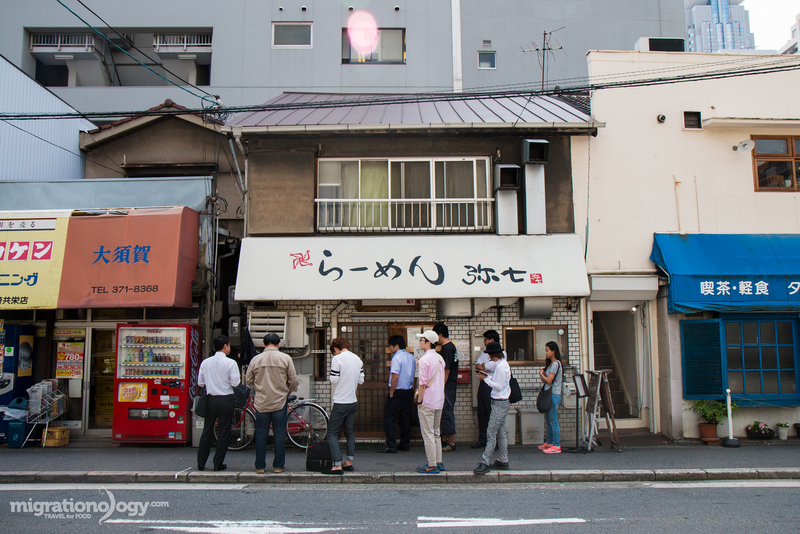 How to get there: Ramen Yashichi (らーめん弥七) is very close to Nakatsu Subway station. Once you exit the station, walk east, and the ramen restaurant is just before you reach the main highway. Hakata Ippudo Ramen is one of the most famous Japanese ramen brand chains, with branches all over Japan, and even in other countries – like Thailand. I wasn’t really expecting to eat here, but after visiting the Instant Ramen Museum, we decided to have a real bowl of ramen, and we stepped into a ramen restaurant that looked good, and because I can’t speak or read Japanese, we had no clue it was Hakata Ippudo Ramen until we got in and started reading the menu. I ordered the Momofuku Classic, a plain but soothing bowl of noodles. 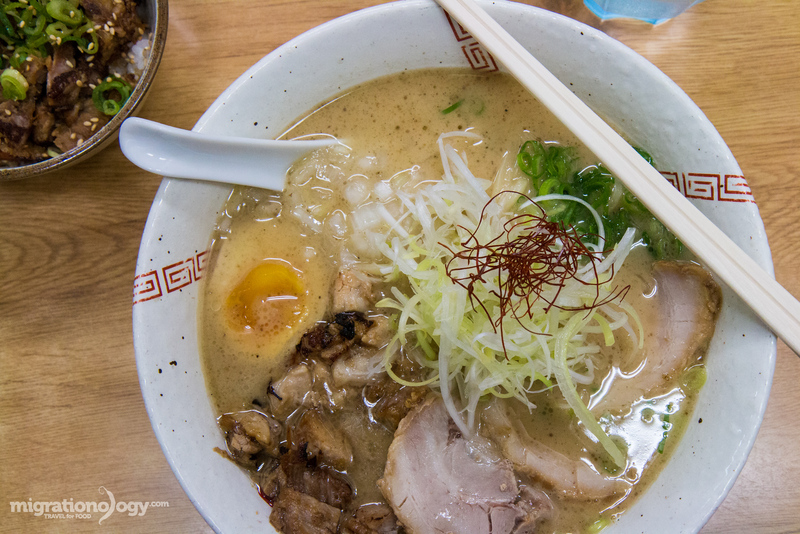 But their most famous ramen is the tonkotsu. 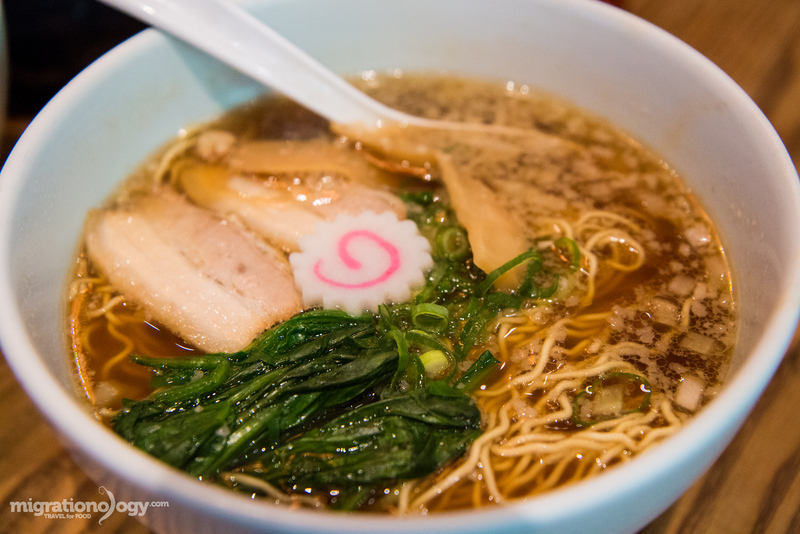 You’ll find a few other branches of Hakata Ippudo Ramen in Osaka, including one at Namba. 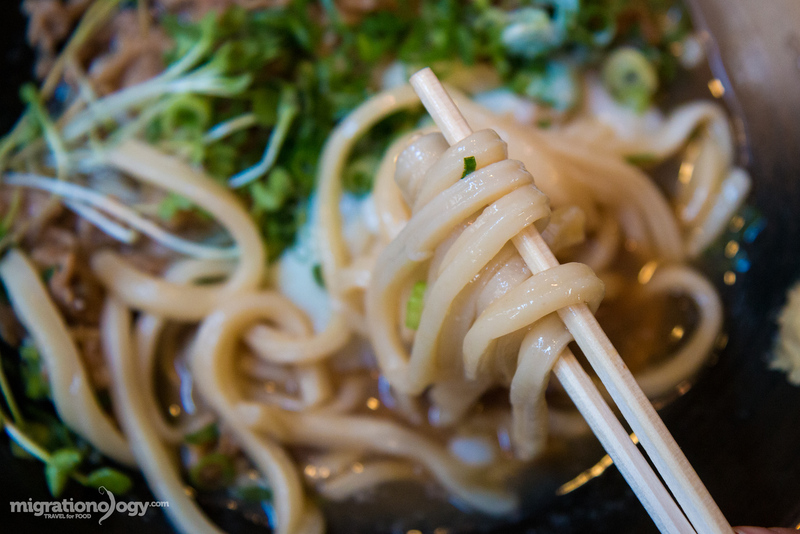 Udon is a thick and chewy Japanese noodle made with wheat flour, and served in a variety of different ways. To me, as opposed to ramen – beyond the thickness difference – udon is sort of the more elegant noodle option. It seems that it’s often a bit plainer in flavor (the broth or sauce is typically not as heavy or salty as ramen), and it’s more of a delicate flavored noodle and even the style of eating it seems more delicate. That doesn’t mean it’s not one of the must eat foods in Osaka, because it’s extremely popular, and really good – it’s probably my wife’s favorite Japanese noodle option. 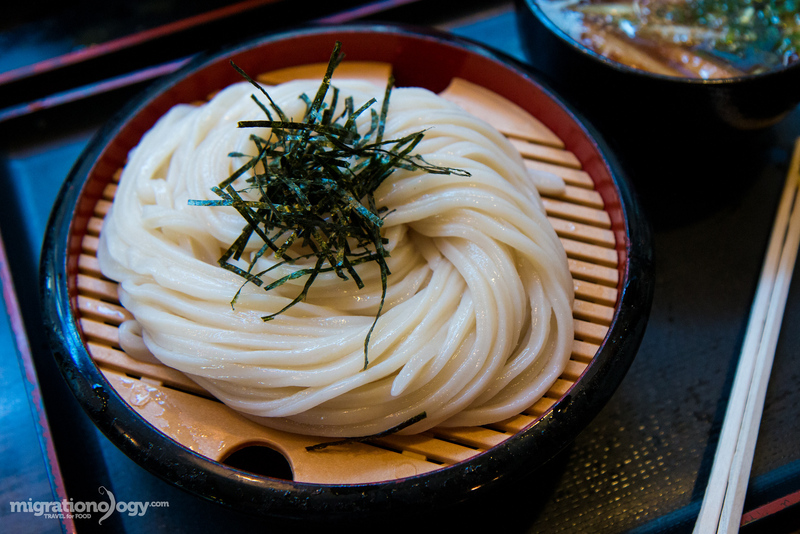 Udon noodles are served in many different styles, including with curry, in hot soup, in cold soup, and even dry with a dipping sauce (highly recommended by the way). Even though all types of Japanese udon dishes are available at restaurants in Osaka, one of the local favorite styles, originating in Osaka, is kitsune udon. The udon noodles come in a light dashi stock flavored broth, and the main topping is a piece of sweet stewed tofu. 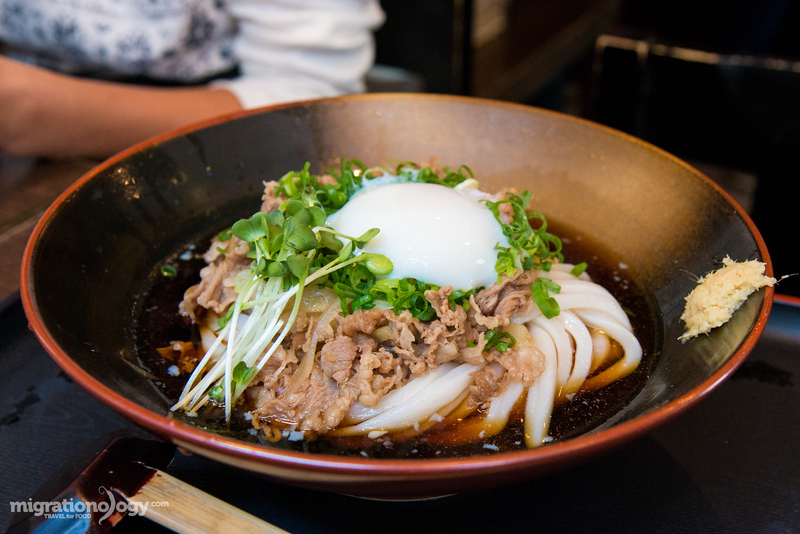 You’ll find some top notch udon restaurants throughout Osaka. Located just down the street from where we stayed for the first week when we were in Osaka, we went to Sanshyu Udon (情熱うどん 讃州) for lunch one day. The udon noodles are all made in house, and I chose to order the curry udon, which came with a pile of shredded green onions and a poached egg (maybe?) on top. Ying ordered the cold udon noodles, in a light shoyu broth, that was ice cold, with an egg, thin pieces of pork, and ginger included. Ying’s bowl of udon was my favorite. 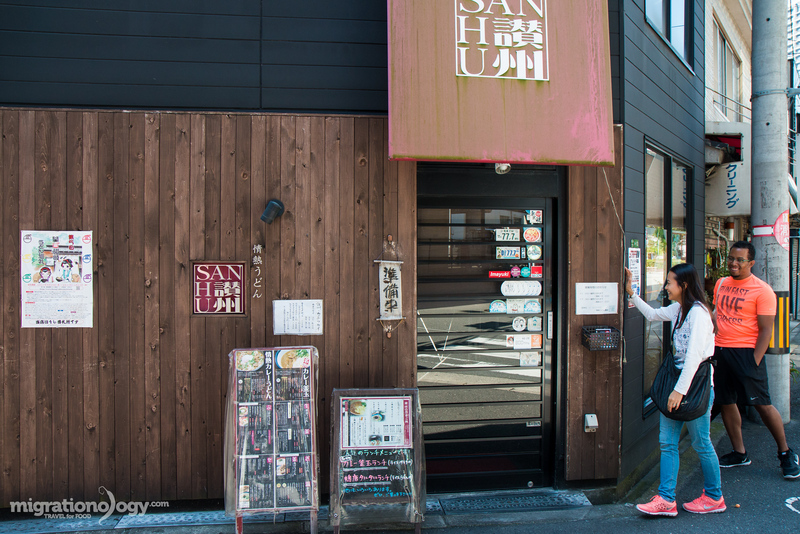 How to get there: Sanshyu Udon (情熱うどん 讃州) is located just two houses down from Ramen Yashichi (らーめん弥七), so you could eat at these two awesome restaurants back to back. Take the subway to Nakatsu station, and walk east for about 5 minutes and the restaurant is right on the edge of the highway (but don’t cross the street). I was seriously hoping to eat at a restaurant called Chitose Nikusui (千とせ) when I was in Osaka, but unfortunately, due to back to back holidays on my last few days in Osaka, I missed it. But it looks so good if you have a chance to try it. Let me know if you try it! When I was attending university in the United States years ago, one of my go-to meals when I really needed some motherly comfort food, was Japanese curry. No, I wouldn’t go to a restaurant, but I’d go to the nearest Asian supermarket, buy a packaged box of Japanese curry base, then cook it up with a bunch of beef and carrots and make a giant pot of fresh steamed rice to go with it. Of all the food included in this Osaka food guide, Japanese curry might be the most comforting of them all. For myself, just like for many Japanese, Japanese curry is one of the ultimate comfort foods. Japanese curry is quite a fusion food, a curry flavor that originally comes from India, but routed through the curry culture of Britain. The curry has a familiar curry powder blend flavor, but the sauce is dark and thick, more like a brown gravy than a typical saucy curry. 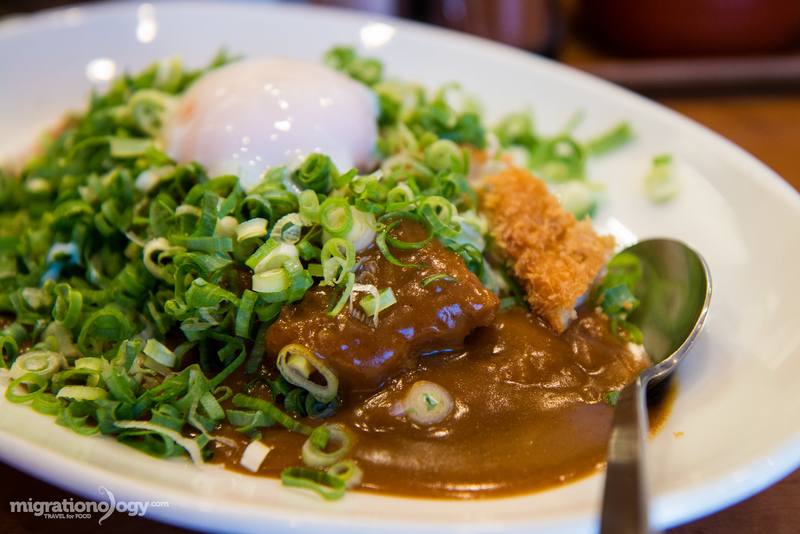 There are a number of ways Japanese curry is served, with udon noodles is common, but probably the most popular is right over a bed of Japanese steamed short grain rice. While Japanese curry can’t compare to the depth of spice in Indian or Thai curries, there’s something about Japanese curry that just makes one warm and fuzzy inside – perhaps it’s the mild blend of curry powder, the thick rich gravy sauce, the option of a fried pork katsu cutlet, and the fresh steamed Japanese rice. 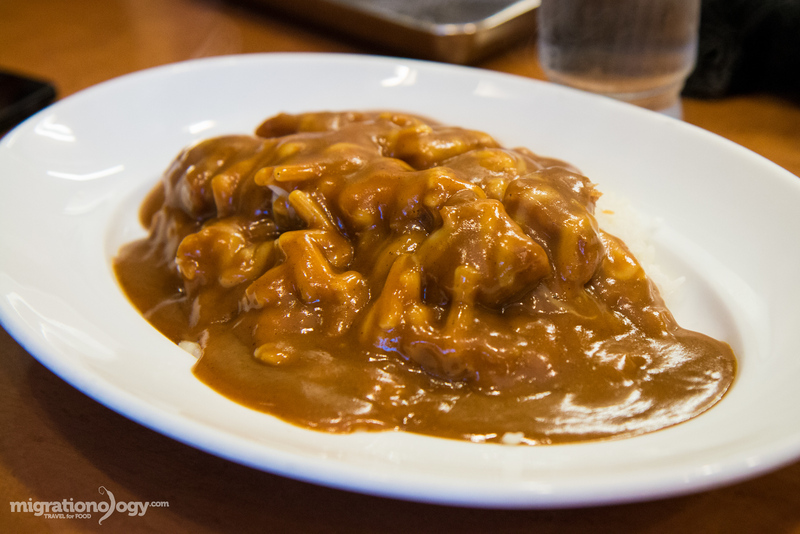 Japanese curry is one of those meals, kind of like ramen, that’s famous for being a 24 hours a day food, and in both Osaka and Tokyo it seems to be a favorite among late-night gamers. Tripadvisor is not always the best guide for finding things to do or restaurants to eat at when you travel. But sometimes there are some great suggestions, and Oretachi No Curry Ya (俺たちのカレー家) was an excellent recommendation for Japanese curry in Osaka. The restaurant, located just a stones throw from Osaka’s Namba train station, is small and friendly, and you’ll see the mouthwatering photos of their curry on the glass outside the restaurant. I ordered their main speciality, a plate of Japanese curry with a pork katsu on top, a cup full of green onions, and finally a soft half cooked egg placed over everything. 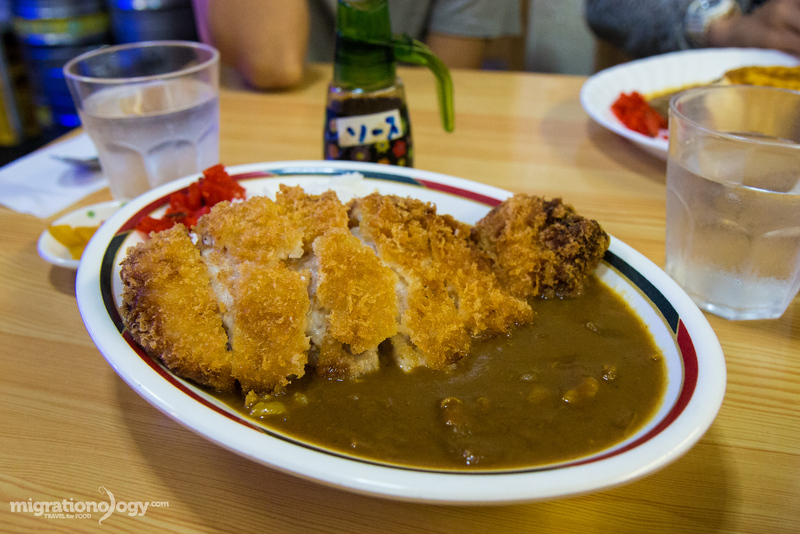 It was one of the better versions of Japanese curry that I’ve had that I can remember – the curry was thick and creamy, the katsu was fried fresh so it was still crispy, and the green onions, in abundance, provided a fresh crispness to the entire plate. 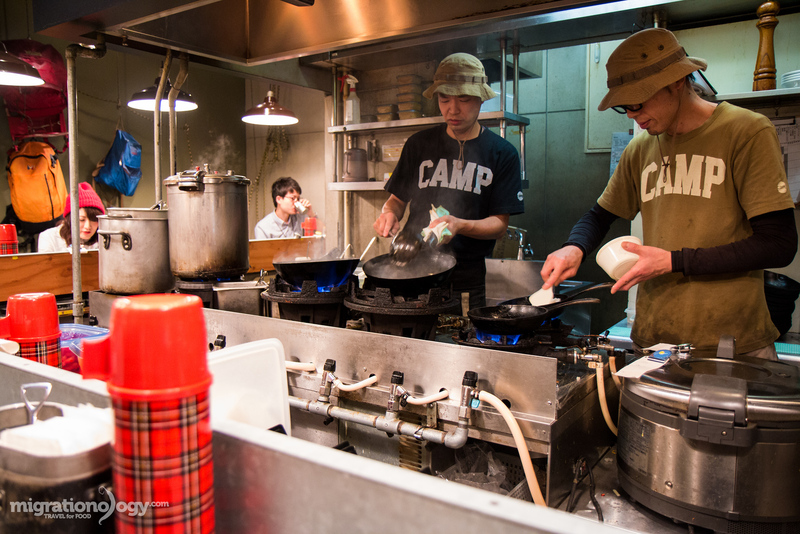 Located somewhere within the confusion of Osaka’s massive Umeda station, within the Eki Marche Osaka food center is Camp Curry (野菜を食べるカレー), a camping and backpacking themed Japanese curry restaurant. It’s a small restaurant, and all the seating is bar counter style, so no matter where you sit, you’ll have a clear view of the chefs cooking your curry fresh. They serve their plates of curry within cast iron skillets, and you’ll even have a shove to eat with. The curry was a little on the mild side for me, but it was a good quick meal right in Umeda Station, and I enjoyed the theme. It’s been said many times that some of the best international restaurants in the world are found in Japan – for instance you’ll find some of the best Italian food outside of Italy in Japan. Ghar Curry家 is a trendy restaurant in Osaka that serves outstanding curry that’s very Indian in flavor and profile, but still served with Japanese rice. I had their lamb meatball curry and their minced lamb curry, both of which were delicious. How to get there: Take the subway to Hommachi station, take Exit 28, and it’s just a short walk from there. One of the best types of restaurant to eat at in Japan if you’re looking for budget eats is a diner style restaurant, which you’ll frequently come across throughout Osaka. (Note: These dishes, like katsu and tempura can be very high end and high quality as well (which is amazing), but for this guide I’ve included the budget versions). Diner restaurants are where people of all walks of life stop in for a quick, easy, relatively cheap most of the time, filling, and pretty good tasting meal. They are sometimes family run, other times they are chain style cafeteria restaurants. At some Shokudo you’ll pay and order from a vending machine, and at others you can walk through a line, and pick and choose whichever dishes look good to you. 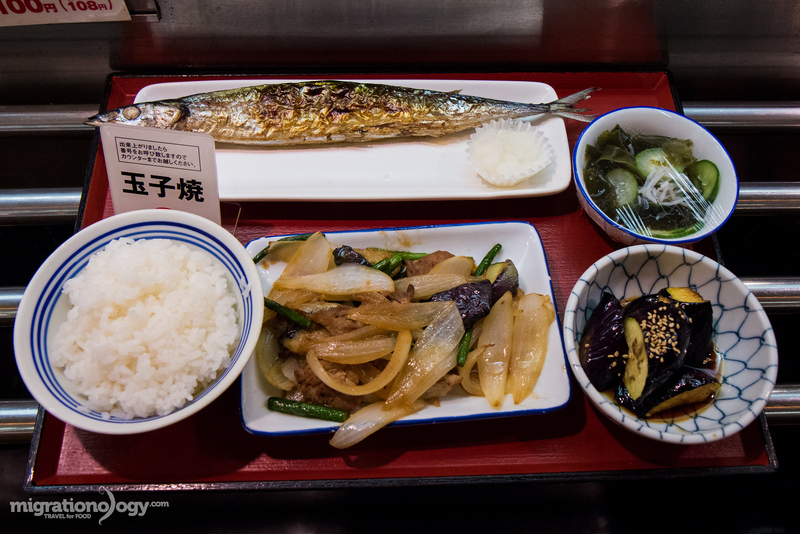 Along with the occasional oyakodon (chicken and egg rice bowl), one of my favorite meals to eat at a cafeteria diner restaurant in Japan is the broiled mackerel set, which typically comes on a tray, served with a few small side salads and pickles, and a bowl of rice. 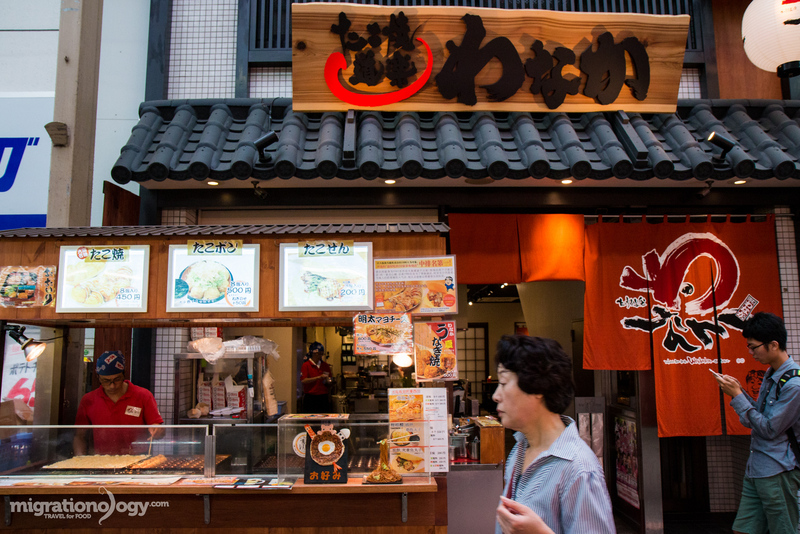 The food is good, and it’s one of the top ways to eat on a budget when in Osaka. This Shokudo Diner (心斎橋食堂) located in the Shinsaibashi area of Osaka is cafeteria style, and you just walk through the entrance and pick and choose whichever dishes you want. I had a fish, an omelet (not pictured), some pickled seaweed, and some eggplant, and everything was pretty good, and I enjoyed the laid back diner style. For my entire meal I spent a total of 1,280 JPY ($10.65), a bit expensive because I took so much food – but you can choose however much you want, and eat on a budget as well. 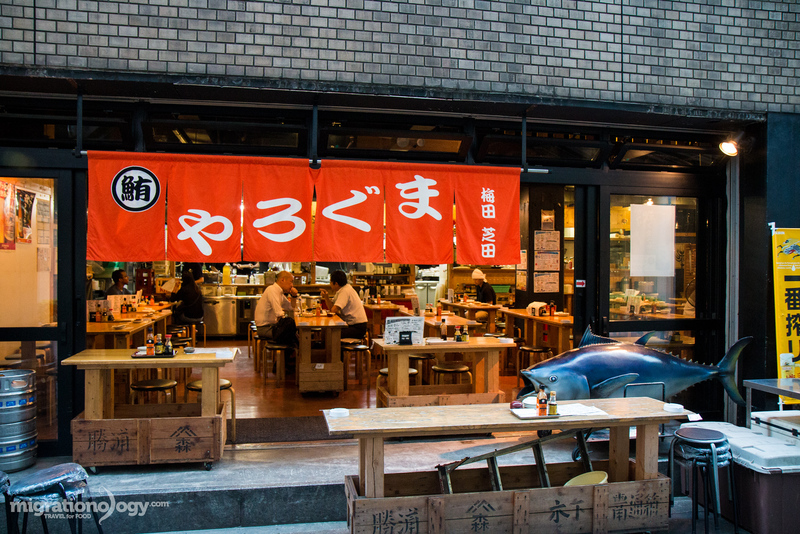 Around Umeda and Osaka stations, where there are lots of people, you’ll find numerous Japanese diner restaurants, all of which serve pretty tasty food. Takoyaki is almost a synonym of Osaka. These little golf ball sized batter balls stuffed with a piece of octopus are perhaps the most famous thing to eat in the city, and they are a big hit and food craze around the world as well. 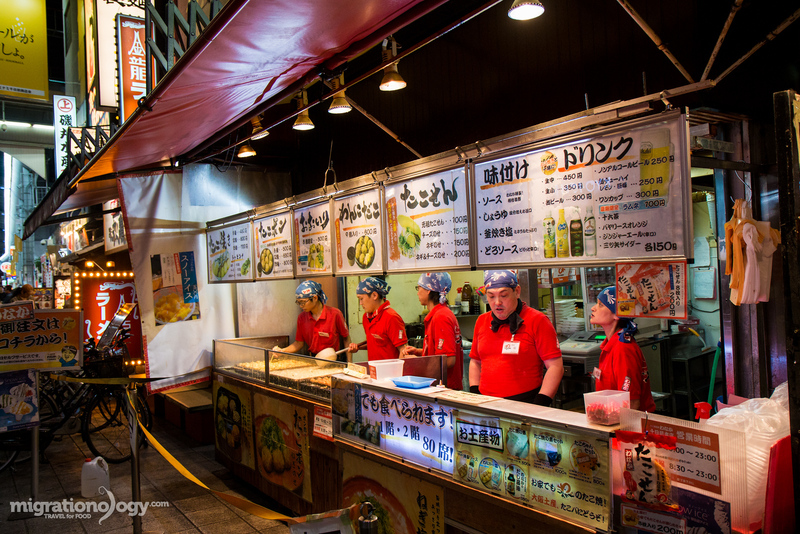 When you get to Osaka and start wandering around and eating, you’ll be quick to find that at just about every major market there are a few takoyaki vendors… and they are typically some of the busiest restaurants in the entire market. 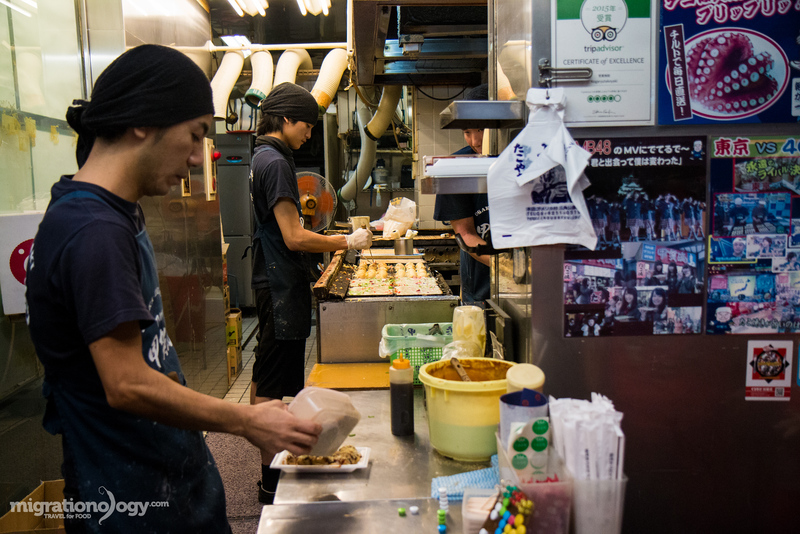 One of the best things about takoyaki is watching them being made. It begins with a hot griddle that includes golf ball shaped holes in it. A bunch of pancake like batter is first poured flat into the hot mold, before a pre-cooked piece of octopus is tossed in the middle. As the batter becomes partially cooked, and when the chef determines the correct time, the chef takes a duo of chopsticks and works quickly to form the batter into balls, keeping the octopus in the center. 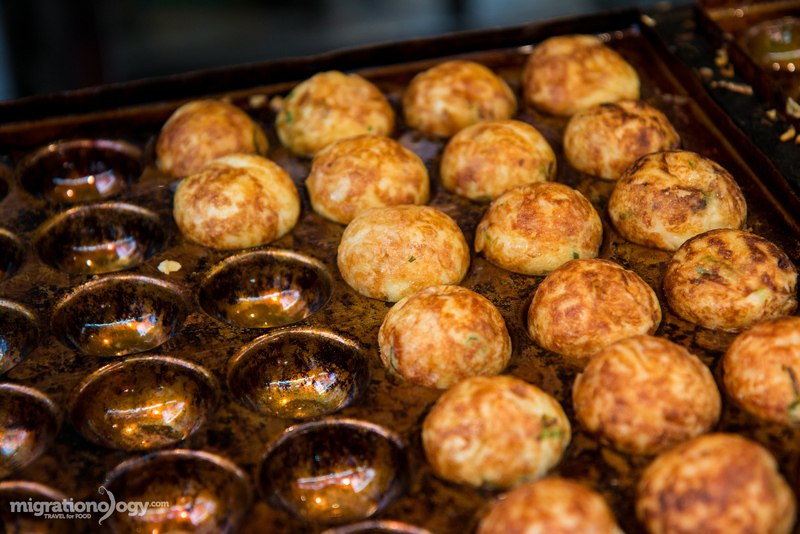 The takoyaki sizzles in the mould until it’s golden brown, and it’s then ready to be dished out. When you order takoyaki in Osaka, they will typically dish them into a boat shaped tray, and then you can order a selection of different toppings – some of the typical toppings include Japanese mayonnaise, takoyaki sauce (which kind of tastes like sour teriyaki sauce), seaweed flakes, cheese, and the mandatory sprinkle of bonito fish flake shavings. For myself, takoyaki is one of those foods that has to be hot and fresh for me to enjoy, so it’s crispy on all the edges, and soft and gooey in the middle. If it sits for too long and loses its crispy edges, it’s not nearly as good. On my first day in Osaka, we visited Kuromon Ichiba Market (great market by the way), and we decided to stop for takoyaki. The restaurant turned out to be Takoyaki Wanaka (たこやき道楽 わなか 千日前本店), one of the more famous brands of takoyaki in Osaka with multiple branches around the city. Our first helping of takoyaki turned out to be one of the best versions I had during our trip – probably partly because we were served when the takoyaki was so fresh and hot. Funny enough, a few days after eating the takoyaki at Kuromon Ichiba, we were walking around Namba, and Ying wanted to eat some more takoyaki. I had no clue until researching for this food guide, that it was the same place (different branch) as the place we had tried a few days ago. Takoyaki Wanaka (たこやき道楽 わなか 千日前本店) is very well known, and very popular. Located in the Amerika Mura (Ame-mura) area of Osaka, Koga Ryu Takoyaki (甲賀流 本店) has been a long-time standing takoyaki shop, and a favorite for many. It’s right in the heart of the district where many people come to hang out and be seen. For myself, the takoyaki was good, but the edges weren’t quite as crispy as I was hoping for. Just like takoyaki, and even similar in ingredient makeup, is Osaka’s okonomiyaki, yet another food that originates from Osaka, and people passionately love to eat. I’ll admit and say that I’m not the hugest lover of okonomiyaki. It tastes good sometimes, but to me it’s just kind of like a big pancake, and there’s not that much to it. However, many others, including my wife Ying, really love okonomiyaki, and because of its popularity throughout Osaka, it really is something you need to experience when you visit. Part of the joy of eating okonomiyaki is seeing it being made right before you, and eating it socially with a group of friends. The batter mixture recipe includes flour, eggs, sometimes dashi stock (dry fish stock), and often a heap of finely shaved cabbage. 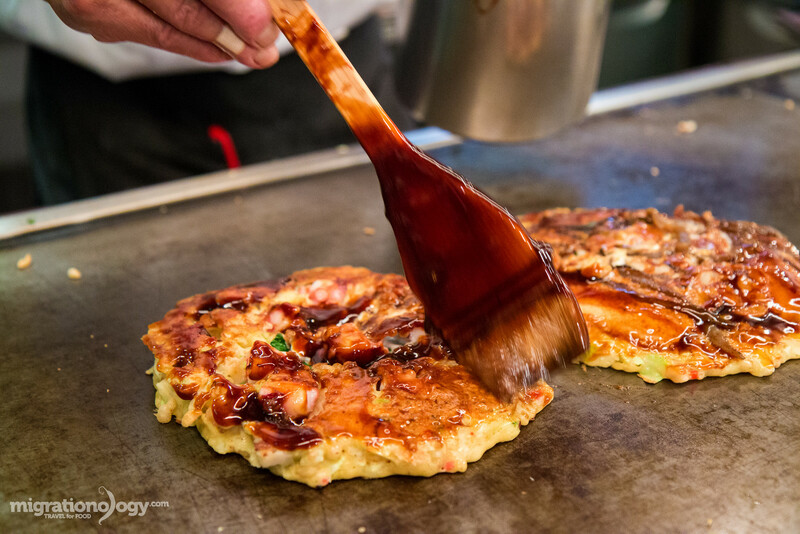 Once the batter is all mixed up, it’s then fried on a hot griddle at the restaurant, sometimes on a hot griddle right before you, and it’s topped and decorated with the ingredients to complete the version of okonomiyaki you ordered. Okonomiyaki is then cut into pizza like slices, and you can either choose to eat it by cutting off a bite, or using your individual spatula to lift up your entire slice to your mouth. 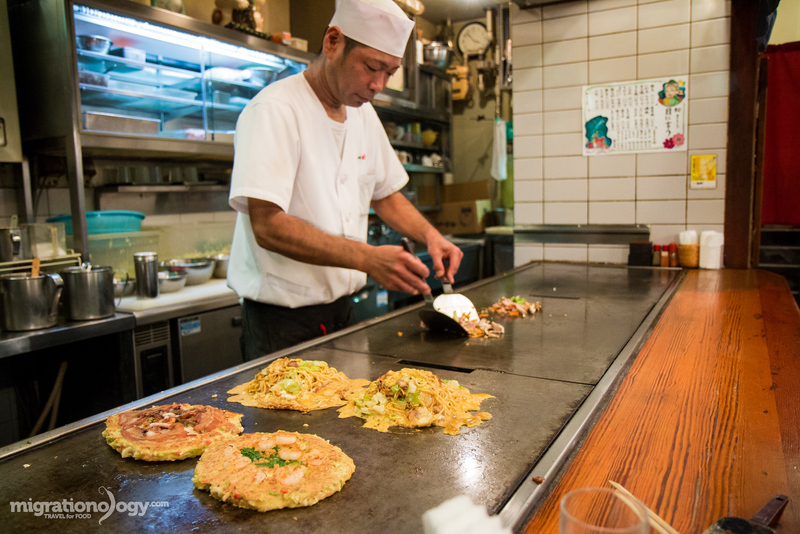 Okonomiyaki Kiji (きじ) – The chef is amazing! Undoubtedly, the highlight of eating at Okonomiyaki Kiji (きじ), was the chef, who must be one of the friendliest chefs in Osaka. And after reading some more reviews, the kindness wasn’t just for us. Along with Dwight and Ying, we tried a number of different okonomiyaki’s and my personal favorite was the version we ordered that was served with mochi rice cakes on top. They were so sticky, they were like melted cheese on top. Overall, a very nice okonomiyaki restaurant, and a great chef. 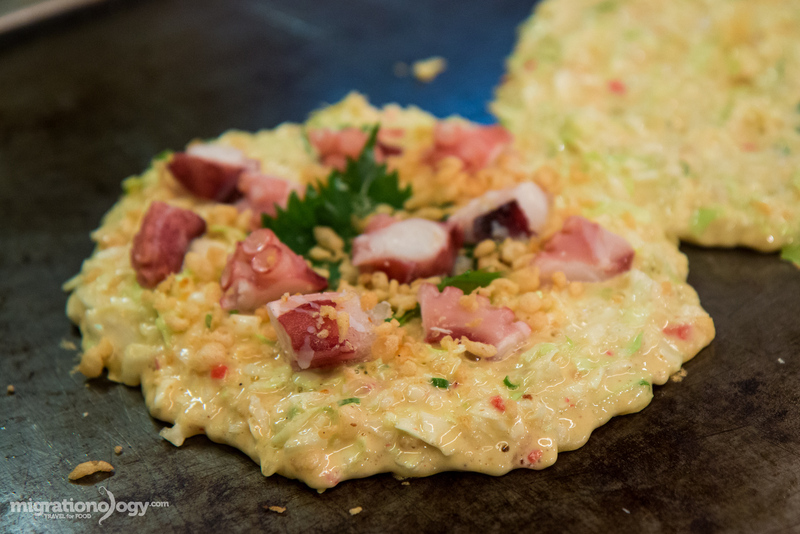 How to get there: Okonomiyaki Kiji (きじ) is located on the basement floor of the beautiful Umeda Sky Building. It’s about a 10 minute walk from Osaka Station. I have to be honest and say I didn’t actually eat at Ajinoya Okonomiyaki (味乃家), but when I was getting some video editing done, Ying went off with her sister and had okonomiyaki here. She also really liked that at Ajinoya Okonomiyaki (味乃家), you could self-add as much sauce and bonito fish flakes as you wanted. I’m not sure if this is the best okonomiyaki in Osaka, but I’ll trust my wife on this one, who said it was really good. 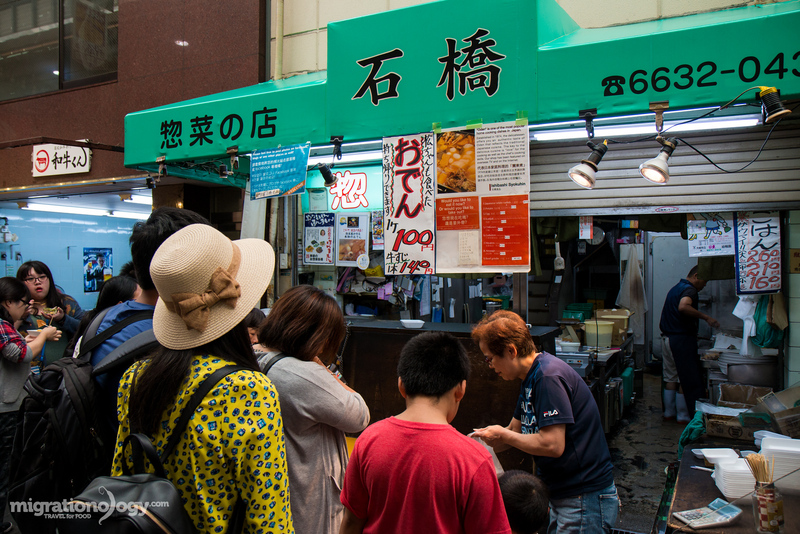 How to get there: Ajinoya Okonomiyaki (味乃家) is located in the Namba area of Osaka. From the train station, head north, and the restaurant is along Hozenji Koisan Dori. Japanese food is known for being extremely pretty and the presentation of the food really stood out to me when I was traveling in Japan. And oden is a Japanese food that I wouldn’t classify as looking too pretty from its appearance. Known as a winter food throughout Japan, oden includes an assortment of ingredients simmered in a broth prepared with a hint of both dashi and soy sauce, giving it a light and soothing flavor. 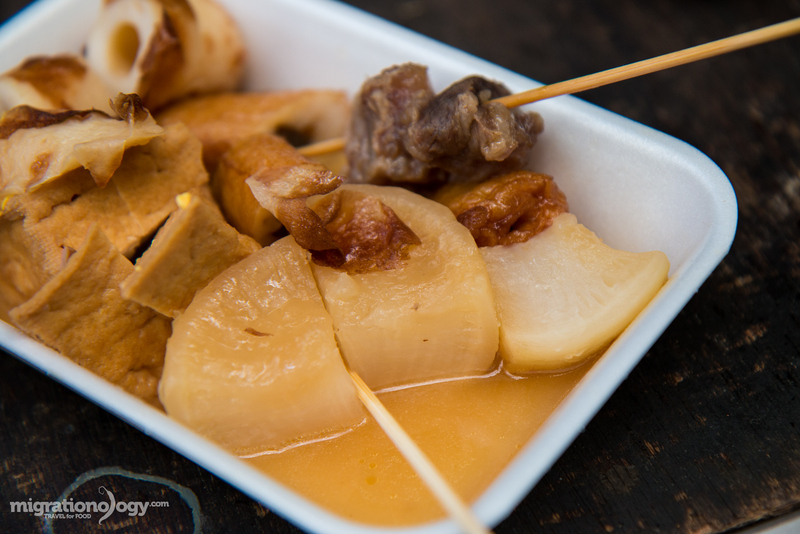 While there can be all sorts of ingredients boiled inside the oden pot, daikon and yaki chikuwa, are two of the most populars items and should be consumed in every oden eating session. Here’s a great guide to oden eating. 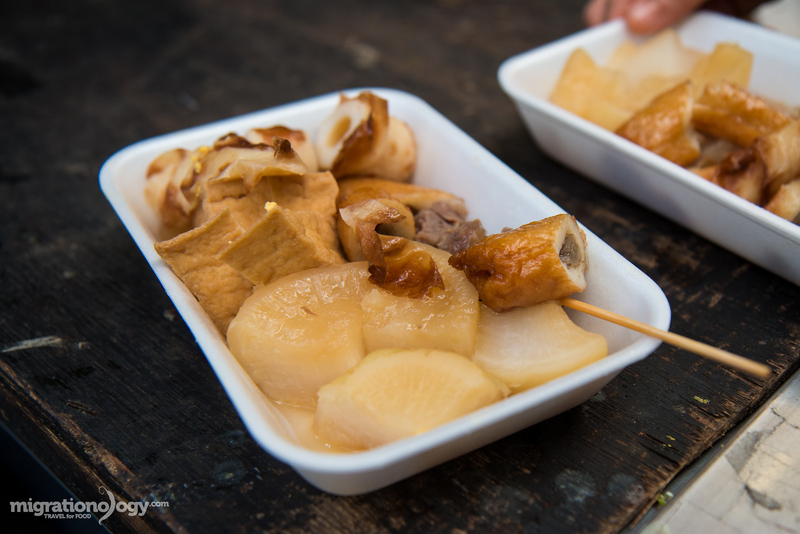 What is really interesting to me, is that oden is a Japanese food that has a huge range of qualities and is available everywhere from street food stalls to highly regarded Michelin starred restaurants in Japan. And you can even get oden at 7 Eleven and Lawson. One of the best places I had oden in Osaka was back again at Kuromon Ichiba Market. If you take a walk down the main walking street of the market, you’re bound to see a nice lady dishing out piping hot vegetables, tofu, and skewers, from a scary looking vat of brown bubbling broth. Don’t be afraid to get in there and choose a few items from the jacuzzi. 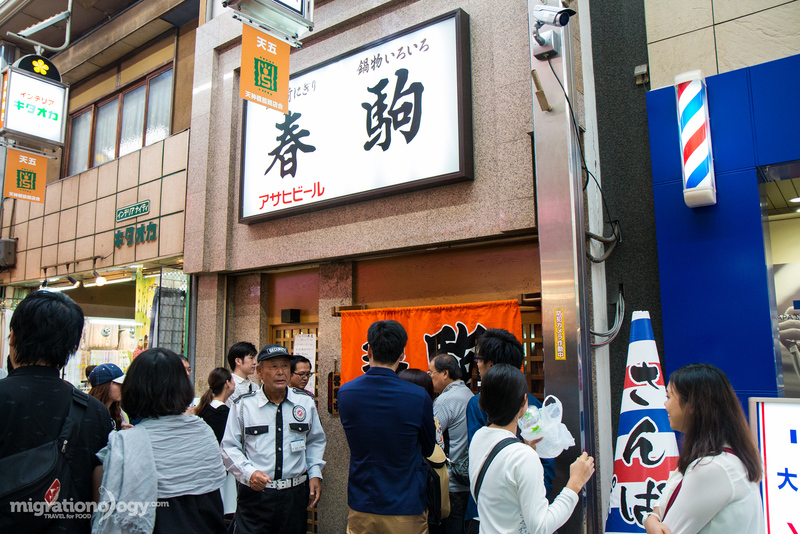 When I was in Osaka, I also really wanted to try Hanakujira, a highly regarded oden restaurant in Osaka, but I ran out of time before I could try it. If you have a chance to go, it looks like it surely won’t disappoint. Born in Osaka, kushikatsu is yet another home-grown Japanese food that’s wildly popular in Osaka. Are you starting to see a pattern of famous snack foods invented in Osaka? Kushi in Japanese means skewers, and katsu means breaded and deep fried things. 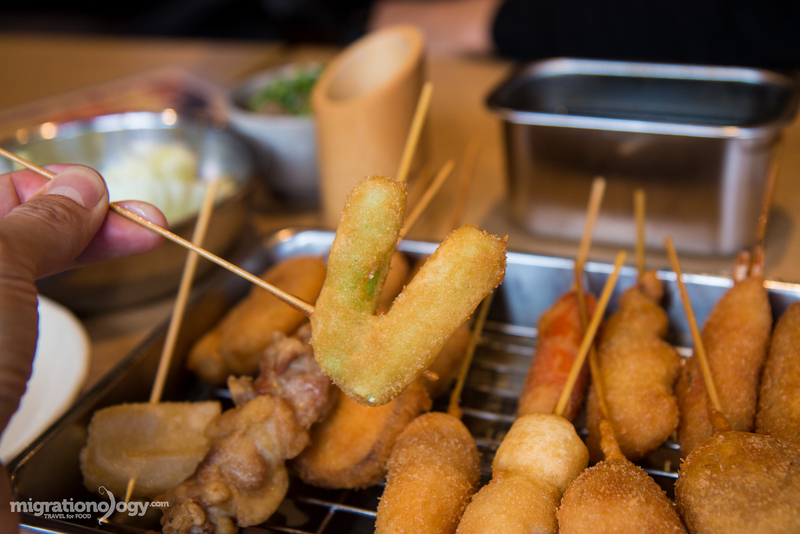 The result of this popular street food is a bunch of vegetables and even meats, all skewered, coated in a light batter, and deep fried until golden brown. Any guesses on what this one is? 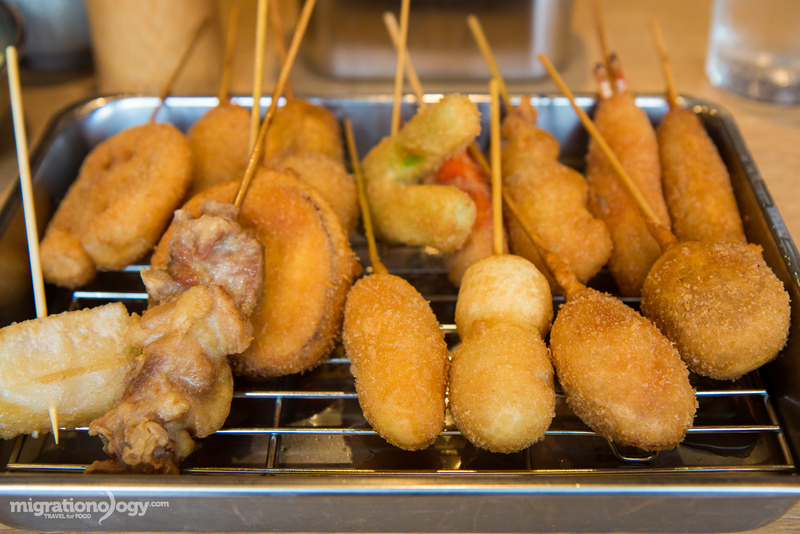 You can kind of think of kushikatsu like assorted chicken nuggets on a stick – with a bunch of choices for what’s inside. Kushikatsu wouldn’t be kushikatsu without the sauce – at least it’s really the sauce that made it good for me. The sauce has a ponzo sauce flavor, kind of like Worcestershire sauce, but more citrusy. 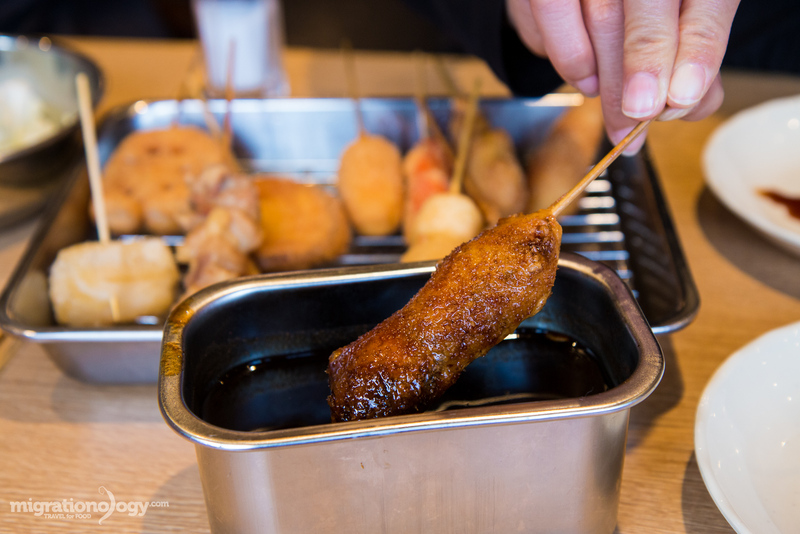 A crunchy fried stick dipped in the sauce is surprisingly tasty. While you’ll find kushikatsu throughout Osaka, the Shinsekai area is home to a high concentration of restaurants serving it, and it’s the area everyone seems to go when they’re in the mood for kushikatsu. 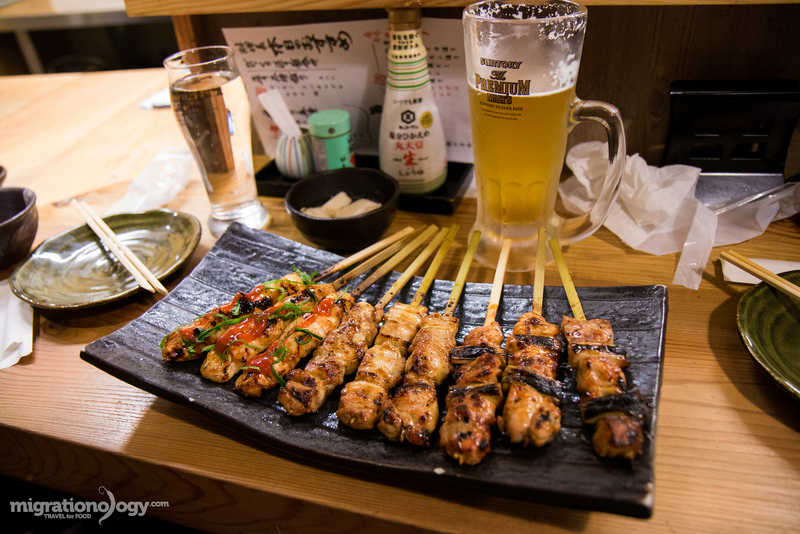 If you like drinking beer, a few skewers of salty and crispy kushikatsu makes a pretty good beer snack. 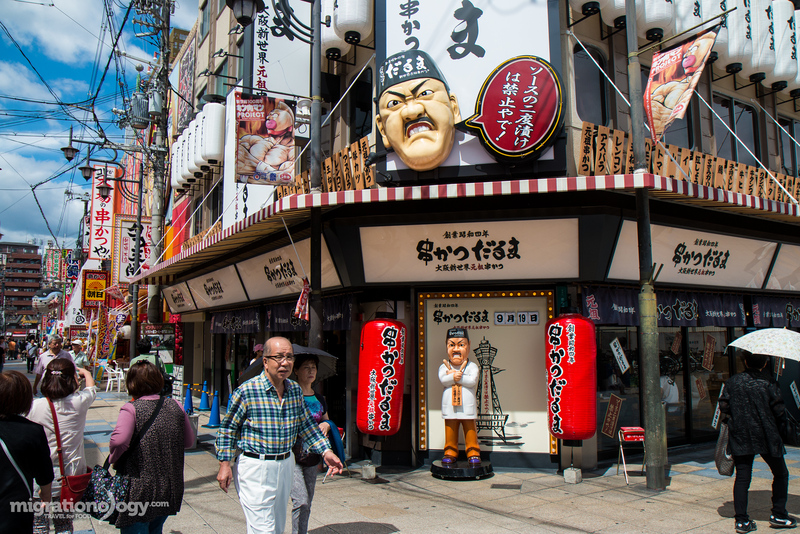 One of the most famous places in all of Osaka that serves kushikatsu is Kushikatsu Daruma (串カツだるま). It’s a chain restaurant, and there are even branches outside of Japan now as well. The original location is in Shinsekai, and we ate at a branch (not the original one), but one about a 5 minute walk away. Since I had no idea what to order, I got the Doubutsuenmae Set for 2,000 JPY ($16.68), which included a range of different skewers which we all shared. I really liked the skewer of beef and the cheese. They sort of tasted like onions rings, but with all sorts of different insides. Again, the sour, sweet, and salty sauce is what really made it good for me. Kushikatsu Daruma is legendary when it comes to kushikatsu in Osaka. How to get there: There are branches of this place all over Osaka, but I ate at the location right in Shinsekai, about a 10 minute walk from Ebisucho Subway Station. Along with sushi and sashimi, one of my favorite things to eat in Osaka are the small plates of delicious food served at Izakaya’s, Japanese pubs. 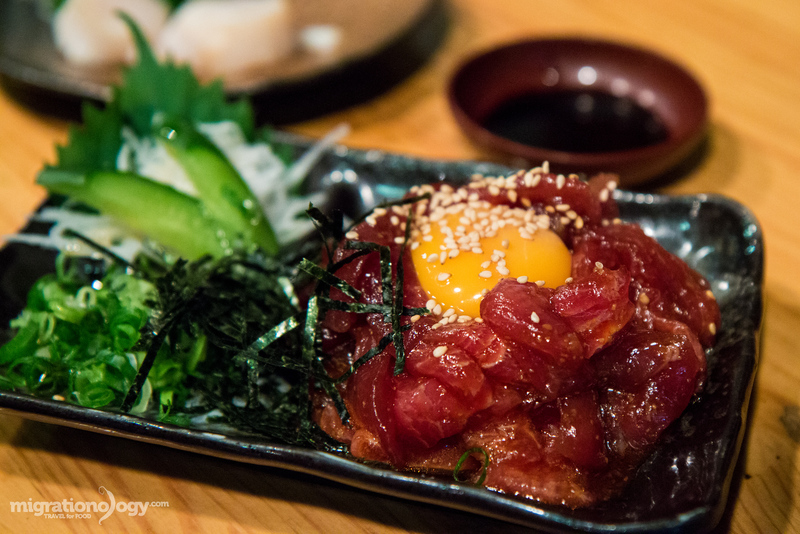 Food is typically served on small plates where the focus is one flavor and quality over quantity, and dishes at Izakaya restaurants can range from slices of tuna belly to grilled skewers of chicken or pork. 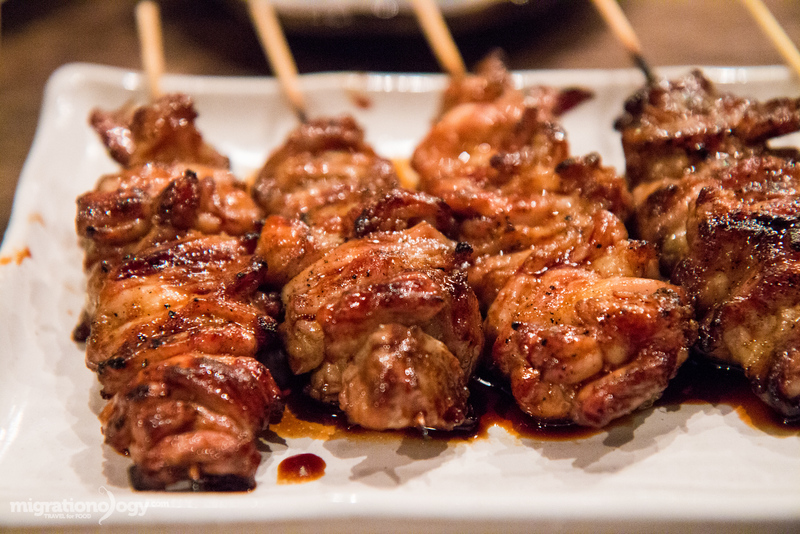 Yakitori, Japanese grilled skewers of chicken, is one of my favorite Izakaya foods. You won’t just get a skewer of bland chicken. The chicken will likely be some of the juiciest and most flavorful chicken you’ve ever had, always cooked over charcoal. 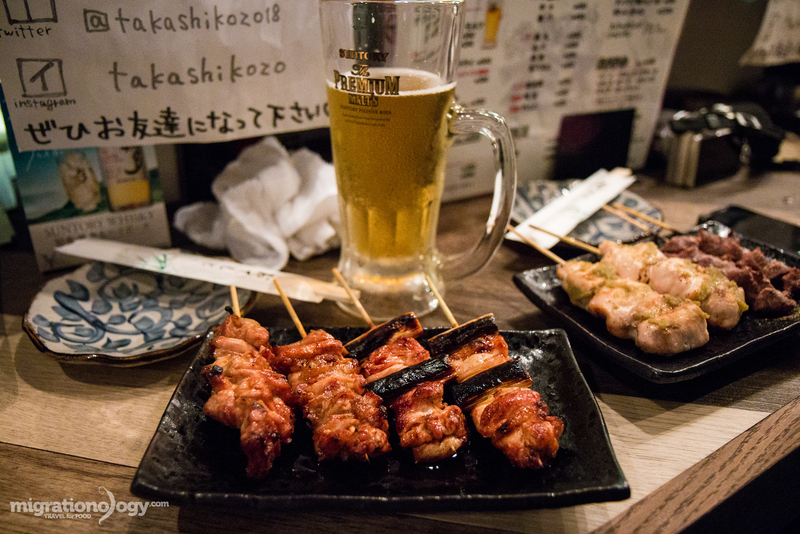 When you eat yakitori at a bar in Osaka, you’ll also have a choice of all sorts of different parts of the chicken including breast, thigh, gizzard, liver, skin, chicken neck meat, and probably even some parts of the chicken you didn’t know were edible (that was the case for me). If you’re not too picky, the best way to order yakitori is to just order the amount of skewers you want in your set, and let the chef mix and match the parts of the chicken for you. The two things that stand out most to me about eating yakitori are that the chicken is always grilled over real charcoal (giving it an always natural and delicious smoky flavor), and that the chicken is never overcooked. Nothing beats the tuna belly! 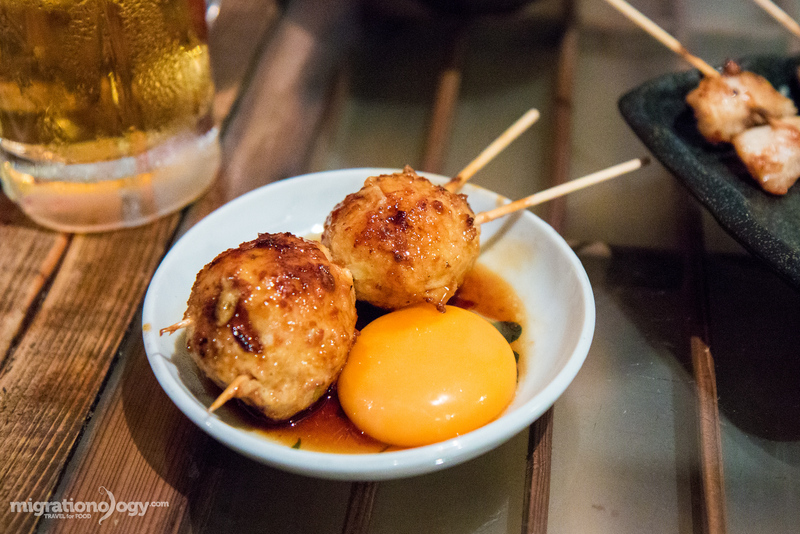 Every izakaya in Osaka has their own main dishe – some serve yakitori, others tuna, or other snacks and small plates of food. 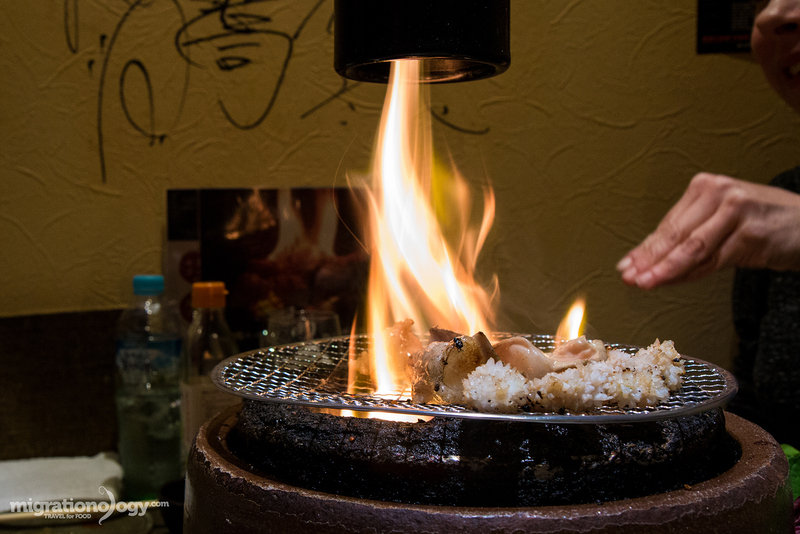 The best thing to do when you go to an izakaya is to order their speciality. 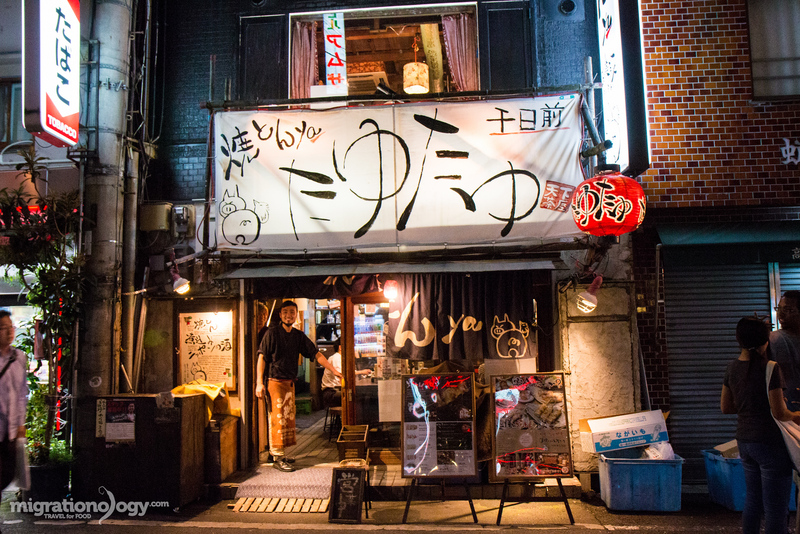 Izakaya’s in Osaka can be small and intimate, with only bar counter seating, or they can be big and rowdy and loud. 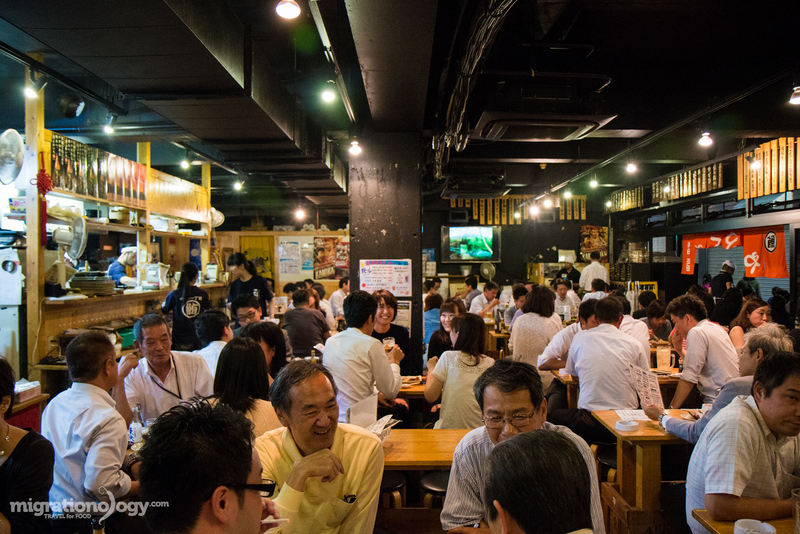 Whatever size of izakaya you visit, you can be sure there will be good food to snack on, drinks, and plenty of good socializing and fun. Tayutayu Nambasennichimaeten (たゆたゆ 難波千日前店) is an izakaya that specializes in grilled pork known as yakiton, and they really emphasize the random parts of the pig (known in Japanese as horumon). The grilled pork skewers were extremely flavorful with a perfect smoky and fatty taste, and the staff were really friendly. How to get there: The location of Tayutayu Nambasennichimaeten (たゆたゆ 難波千日前店) that we went to was right across the street from Dotonburi. You can get there easily from Nipponbashi station. Dwight had checked this place out on his previous visits to Osaka, saying it was the ultimate tuna spot… and he wasn’t joking. Chayamamchi Maguroya (梅田芝田一丁目まぐろや) is a loud, busy, and still friendly, izakaya in Osaka that specializes in tuna in all different forms, sizes, and degrees of rawness. You can get oden cooked skewers of tuna eyeball socket and fried tempura, but the real highlight is indulging in a plate of melt-in-your-mouth tuna belly that’s so buttery, it will dissolve on your tongue (without you even chewing). How to get there: Chayamamchi Maguroya (梅田芝田一丁目まぐろや) is located on the west edge of Umeda Station, near the railroad tracks. Use the map to find the exact street. This is yet another place I went with Dwight. This time, he had to return an umbrella because the owner had let him borrow it a few nights before. They invited us in, and we ended up having one of the greatest local Japanese izakaya Osaka experiences – food, fun, sake, and a really friendly crew. On my last night in Osaka, my wife and I were walking around the Namba train station area and went into the walking street of Doguyasuji. 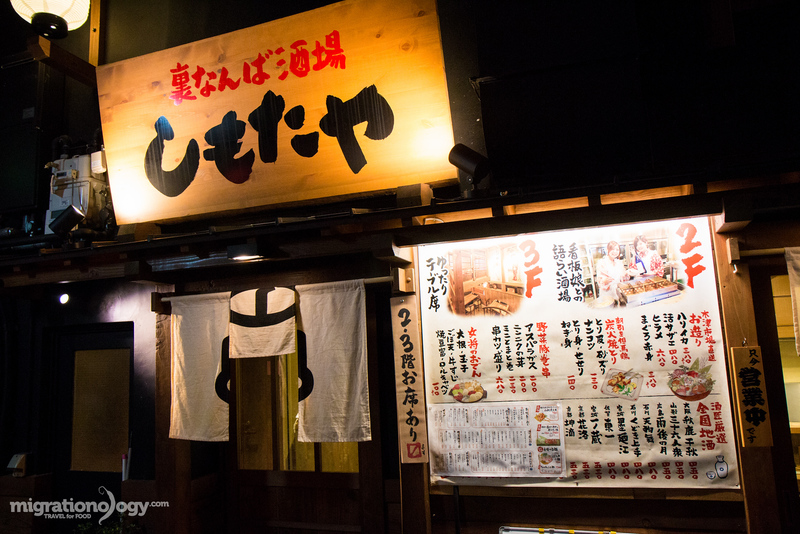 Doguyasuji is known for its kitchen supplies, and also for its izakaya bars and restaurants at night. There are many to choose from. We stopped in a place down a side alley called Shimotaya (裏なんば酒場 しもたや thank you to everyone for your help in the comments identifying this place), and it was the perfect way to end a 14 day eating trip to Osaka. I didn’t want to end this Osaka food guide without a quick mention of an Osaka speciality meal called kappo, the Osaka version of an elegant kaseiki meal, but instead served bar counter style, where you eat with the chef watching you – and you can see everything the chef does. Kappo is typically a very high end meal, where the chef emphasizes freshness, presentation, and creativity. It’s more than just a meal, it’s an experience. Kigawa is one of the famous kappo restaurants in Osaka, and you can read reviews about it here and here. Unfortunately I didn’t have a chance to try a kappo meal when I was in Osaka, but I’m hoping to have the chance on future visits. The language of Japanese has a lot of cool words. But probably my favorite is Kuidaore, a term that translates to eating oneself into bankruptcy. In my opinion, the term doesn’t have to do with the fact that Japanese food is a bit on the pricey side, but it’s rather a metric of the abundance of food and how food is such an important part of social life and culture in Osaka (also check out my Tokyo food guide here). While I hope you don’t spend your entire bank account on food when you’re in Osaka (although that wouldn’t be a bad idea), I do hope you come very close to accomplishing this Osaka tradition, and I hope this Osaka food guide gives you some great ideas about all the delicious food available, and restaurants to try them at. Enjoy the food, and if you have any questions about visiting Osaka, or any other food tips or restaurant suggestions, I would love to hear from you. Are you ready to eat in Osaka? Leave a comment below now! If you like my photos and videos, check out the camera I use. 353 comments. I'd love to hear from you! I’m missing Osaka sooooo much! Now that we are living Catalonia, I miss Asia food in general. There are sushi places here, and we do have amazing fresh fish, but it’s just not the same as eating in Osaka. 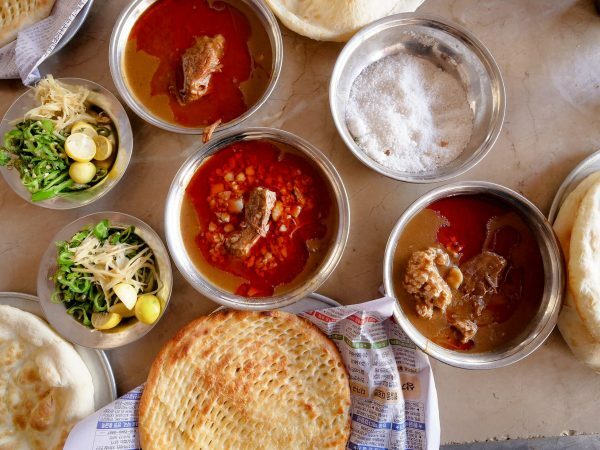 One of my favorite food cities in the world! Thanks for sharing. Very interesting article, excellent work! I really appreciate people who put effort in things like this. I’ll use this post as a guide when I go to Osaka, thank you! 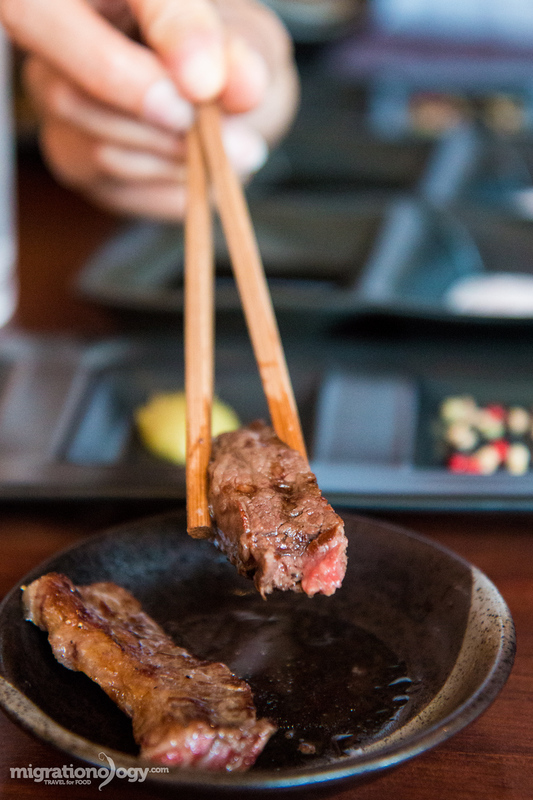 Definite YES to grilled beef and Izakayas! 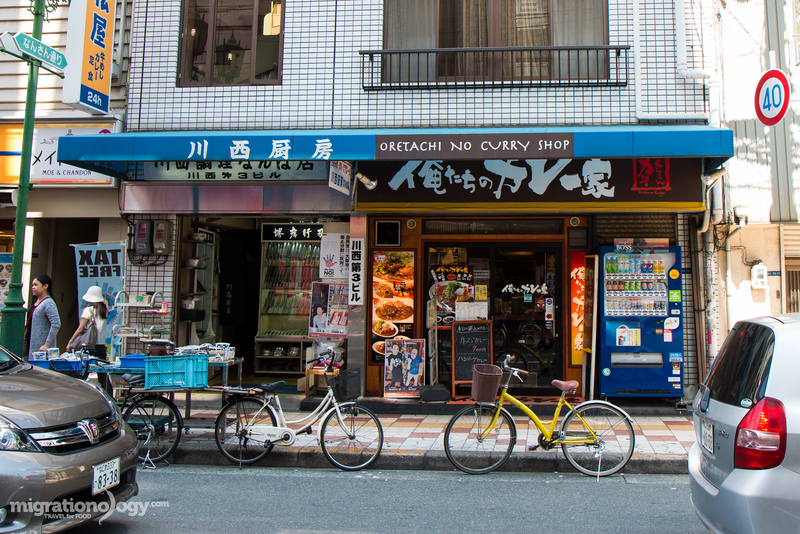 I can’t wait to go back to Osaka and try the rest on your list!! Well written and very helpful in understanding the different types of food in Osaka. I am glad every second word was not “Amazing” – which tells me the article is written by an experienced & well rounded traveller. I’m watching & Love the food travel here in Fruitvale Village Oakland, California USA. I have been watching your video all the while and it has been very enriching. Will be traveling to Osaka/Kyoto/Kobe this year. Just wondering is it very expensive to travel from Kobe to Tokyo by Train? And which would be the prefer area to stay in Osaka? This is exactly what I was doing in Japan. Visiting different cities just to try out ramen, sushi, udon, umorice, sashimi and a lot of Japanese cuisines. I just can’t get over with it. Looking at your photos make me reminisce of my Japan trip. I can’t wait to return there. Thanks for this! I have lots of family in Osaka (my mother grew up there and later moved to the US). Having eaten a lot of this food made fresh at home, going to Osaka was fun. My relatives knew what “hole-in-the-walls” to eat in. Food was always excellent and the prices were great. I don’t think I ever saw an American in any of those. I also ate and drank beer at a German gasthaus, had an excellent French restaurant dinner with fine wines, plus a visit to a Kobe beef house. Let’s not forget fugu (blowfish). That was amazing! My aunt served me a traditional Japanese breakfast every morning. I gained 5 lbs in 2 weeks eating Japanese food. I was skinny to start with. All that healthy food and I ate a lot of it. I lost the weight once i got State-side. Have fun in Osaka! If you have the chance, go to a seafood restaurant where you can get a steaming pot of crab legs, shellfish, etc. Or try the grilled sparrow…really good. Ika no shiokara, salted squid, is delightful with a cold beer or sake. For sushi, my uncle ordered delivery. The delivery person brings it via bicycle in a cooler on a nice melamine plate that you return the next time you order. It was way better than any sushi I had in the US. That was a treat. Osaka is an adventure in food! I have heard about coromon echiba market. Have wish to visit their. One of the most known food item i have heard is sushi, although I have eaten in my country but would like to taste over their. I will visit Osaka soon. Will be going to Osaka just for the food after three weeks of rock climbing in china. we will be eating all the foods. this article was very helpful. Awesome to hear that Nick and Emily, hope you have a great trip and enjoy the food! Going to Osaka on August, hope I could find my way to those places when I get there. Can I just ask, how much is your daily food budget? Including Bfast, Lunch & Dinner? Would 3000JPY be enough for a day? Thank you! Thanks alot for all the sharing… looking forward for a good trip with all these nice food in Osaka next month. I am going there for two weeks starting April 1. I cannot wait to try out some of the dish! I’m not going til June, but research starts now. Thanks for the guide! Going to Osaka in April and looking forward to checking out the places you’ve mentioned. Flying today from Argentina to Japan , and I’m definitely using all your guides as reference. Any way, thanks for you awesomeness Mark!! Hey Diego, great news that you’re flying to Japan. Yes, very doable, do it all, and enjoy the food! Hi Mark, your vid is sure my top reference for me as I am going to Osaka with my wife next Month. Just wondering why do you know so many nice place to try food and drinks consider this trip is a rush trip (on your day 1 video you said your decision is a bit rush for go/no go). You know it took me more than 30 hours to do the research until I know that you have Osaka vlog. The research now is over. Cheers Mark. Thank you very much Tristan, and hope you have wonderful trip. I started doing a lot of research quickly, on local blogs / websites, and also when I started posting on social media I would get recommendations on where to eat from locals. So that’s mainly how. I enjoyed watching your video, and your expression for every new “taste sensation.” I am going to Japan in a couple of weeks, and am soooo looking forward to the food!!!! Thanks for sharing your food experiences. heading to Osaka in a couple of weeks, hope that we would be able to try your fantastic recommendations. My mouth was already watering just reading your blog 🙂 thanks! Hey Jelaine, that’s great news. Hope you have a great trip and enjoy the food! Did you seriously recommend a chain ramen restaurant from Fukuoka as an example of Osaka cuisine? It has Hakata in the name, the old name for central Fukuoka. Used to teach there in the 90’s. Kiki was popular back then. Although they ere in a nearly impossible location to find. The owner was friendly in those days as well. Good to know they are still in business. Ready to eat in Osaka but clueless as to where to go. Yelp and Trip Advisor hasn’t been very helpful. Help!!! I am currently in Ikeda, Osaka. Just went to the Momofuku Andover Instant Ramen Museum. Not sure where to go now! Hi Mark! Just wanted to let you know that my husband and I found your food blogs and vlogs about osaka food really helpful for our recent trip! We tried most of your recommendations and honestly – the food was incredible! Our favourites were Harukoma (such a great price for awesome sushi!!) and the tuna man at kuramon markets. We actually first found your site whilst looking for places to eat in Taipei last year on our honeymoon – and we also tried most of your recommendations then too! You’re basically our yearly holiday routine to get advice on amazing food now. Thanks so much for this site! Your commendations and your vlogs are awesome. Hi Priscilla, awesome to hear from you, and glad you and your husband had a great trip and enjoyed the food in Osaka. Thank you! Hey Apolo, hope you can visit! The food has a realy good aspect. Loved your suggestions. I lived in Osaka many years ago and I think you did justice to the food scene there. A suggestion, Japan has its own style of Chinese food, Japanese style. I can’t remember the term in Japanese anymore but it’s something you might explore if you are interested. Saw you on Zimmerin Bangkok show and was sold on your food opinion. Hey Jeff, thank you very much, and I appreciate your recommendation. Would love to spend more time in Japan! You’re awesome! The reviews and vlogs are exceptional and very entertaining. Thank you very much Justin, glad this is helpful. One of my favorite Japanese foods to eat sushi, but I’m not the biggest fan of the nigiri style. Personally, I only like nigiri sushi when it has unagi, which is eel, or shrimp on it. Other than that, I mainly like to eat the type that come in the roll form. However, I especially love sushi rolls when they are made with tempura. I recently found your blog and videos channel while watching your Singapore food vlogs. The food looks so delicious; I’ve subscribed by the way. Hi, All your blogs and videos are always outstanding, I share them on Facebook all the time. Thanks . We learn so much . Going to start with the homegrown favorites like takoyaki and okinomiyaki. After reading your remarks about Kobe beef my mouth is watering. Thank u for the recommendations and directions. I hope to gain 10 kilos! When you gonna visit hk?! Hi Mark! your experience is very inspiring! and i enjoy all of your writing and you youtube videos! I’m in Osaka right now and this post saves me so much searching time. Going out to hunt for that tuna belly! Thanks for the best food blog ever! I have watched all your videos about Japan. They were all very detailed and helpful. Thank you so much! However, I just wonder that if you want to go to a place, how do you know what trains or buses or subway stations, etc…that you have to take to get there? Did you use any apps or tools to find out? I loved your page and also your video of your 14 days trip to Osaka. This will help me and my husband for our trip to Osaka next week. We will be staying there for 12 days so we are really excited to try their food. I hope someday you can visit our country, Philippines and also try our local foods here, Im sure you’re gonna love it as well. Thanks! **I also subscribed to your channel, and loved all your videos. Specially your reaction everytime you taste the food, it’s like the taste is so heavenly and it sometimes makes me hungry by just watching you eat. Haha.. Keep it up! Oh Wow Mark, thoroughly enjoyed reading your Osaka food journey, it brought back so many scrumptious memories for me, thank you! I was there for 4 years and most of my days were spent trying out different eateries. All my Japanese girlfriends said that it’s the national past time (along with shopping). There was a really tiny hole in the wall shop at the basement of Daimaru in Kobe that did the best Maguro-toro with negi (shallots) and sesame dressing…. it was cheap and generous and best of all delish! did you happen to come across this one by any chance? Hey Ella, great to hear from you, glad this brings back some delicious memories of eating in Osaka. Hmm, that sounds really good, but I don’t think I came across it. Makes me want to go back immediately to Japan for some more food! Love your stuff. I was wondering do you have a Google Map showing all of your places you visited and/or ate. Something similar to the Tokyo Google Map which is an excellent resource!! My Wife and I spent the last few days in Osaka eating what was probably the best meals of our lives thanks to your blog post. Many thanks and great work! Hi Weiyi, that’s awesome to hear, glad you had such a great trip! Mark God Bless you!! you make my days very interesting and you always leave me hungry!! Keep up the good work this was great I watched every episode while you were in osaka! Much love and success to you!! Hi Michael, good to hear from you. I didn’t buy a train pass, because I only took short train rides from Osaka to Kyoto and Kobe, but didn’t go further than that. If you plan to do more extensive long distance travel pretty quickly, I think it may be a good idea to buy a pass. For language, it’s not too hard as long as you’re not in a rush and have time to look at the signs thoroughly – there will usually be English signs if you look. Hope you have an amazing trip! Greetings to you from Toronto. Its been great spending all this time following you and Ying to Tokyo/Osaka/Kyoto with all your fantastic informative insights. No question you are a lover of food in all its many, many forms. My wife and i have to turn away from watching you and take a time out because you make us salivate so much. Its just too much to bear for the hunger. We have to wait till beginning of May when we will be in Japan for a 14 day eating bonanza. Byeee for now. Hey Ronnie, great to hear from you, awesome that you’ll be going to Japan soon! Traveling to Tokyo, Kyoto and Osaka next month. Thanks for the food bucket list. Hey Rienk, awesome to hear that, hope you have an amazing trip! Thanks for the tips Mark! I recently took a trip to Osaka and tried Tokisushi near Kuromon Ichiba market based on your recommendation. Needless to say, it was delicious! Hey Jonathan, you’re welcome, glad it was helpful! We are planning a trip to Osaka, Kyoto and Kobe. My husband and I are both chef de cuisine, living in Luxembourg, Europe. Just border to France! We have a little sampling of Japan last September, for 4 days only but simple fall in love to Japan. We have been to the Tuna auction in Tsukuji fish market. 10000 yen of taxi ride plus got up at 2:30 am are totally worth it. My 10 years daughter choose this over Disney Tokyo….My girl Aiko want to visit visit the Wasabi farm but later we found that Osaka region is also full of culinary adventure, so we are planning to do that this year. Anyway, notice that you are into cooking? Eating! We know that we can count on your food guide! You are such a blessed people live in Thailand which it has the probably the most interesting cuisine. Thanks for your blog, review and suggestion….and your Eating! Thank you very much for this superb and detail blog. I’m going with my wife in March to Osaka and a bit of saliva fell on the computer while reading your blog!! Just one question, do you think that a Ramen broth can be vegetarian or not? Do you have this option when you order on the machine? thank you for your answer! Hey Mark! I’ll be going Kyoto, Osaka and Wakayama this April and without a doubt I’ll be following your food guide! by the way, where is the juicy fried chicken location? Thank you Tristan, hope you have a great upcoming trip to Osaka! Mark, Keep up the good work I’ve spent that last 2 hours watching your Burma/ Japan movie! rad brother! Hi Mark. I love foods so much, and I have watched many of your videos. I’m appreciated for your hard work and effort. Not sure if you are a big fan of Chinese foods, you should go visit Guangzhou, China. Different varieties of the delicious foods, dim sum (most famous in the world), street foods, attractions around and inside the city, and lots of shopping centers would definitely make it a worth place for visiting. Hey Cody, thank you very much for your support. I’m a huge fan of Chinese food as well. I’m hoping to spend some time in China in the future! Thanks for the list! Now I know where some of the known good places are. Thank you very much Yuletak, hope you have a great upcoming trip to Osaka! We literally just booked our trip to Osaka because of you! We will be in Osaka, Kyoto, Nara and Kobe during Christmas and New Years period, super excited! Your blog and youtube videos are both my food bible! Thanks Mark and keep up the good work! P.s If you ever visit Bali, I’ll wrote you some local street food recommendations. After following your blog and youtube channel for the last few months in the lead up to our Japan holiday, today was finally the day my wife and I embarked on our “Mark Wiens Recommended Day” in the Osaka region. First up was yakiniku lunch at La Shomon in Kobe which was amazing! The staff were very happy when we told them we’d come from Osaka specifically to eat at their restaurant and we showed them their own photo in your blog (http://migrationology.smugmug.com/Japan-2015/i-rG6DM5N/0/X3/kobe-beef-japan-1-X3.jpg). After a train ride and a few hours walking around Himeji Castle (so many stairs), we headed back on the Shinkansen and metro to Shinsaibashi to hunt down Ikkaku. We ordered the same things as you except only young chicken and we were not disappointed. I am a huge fan of chicken in all it’s forms but this was just perfection. After finishing all the plates, even though I was feeling full I had to order another piece of young chicken or I knew I would later regret not doing so. We have another few days left in Osaka before we head to the Gifu region and we’ll be trying to visit both Harukoma Sushi and Chayamamchi Maguroya since we’re both huge sushi/sashimi fans. 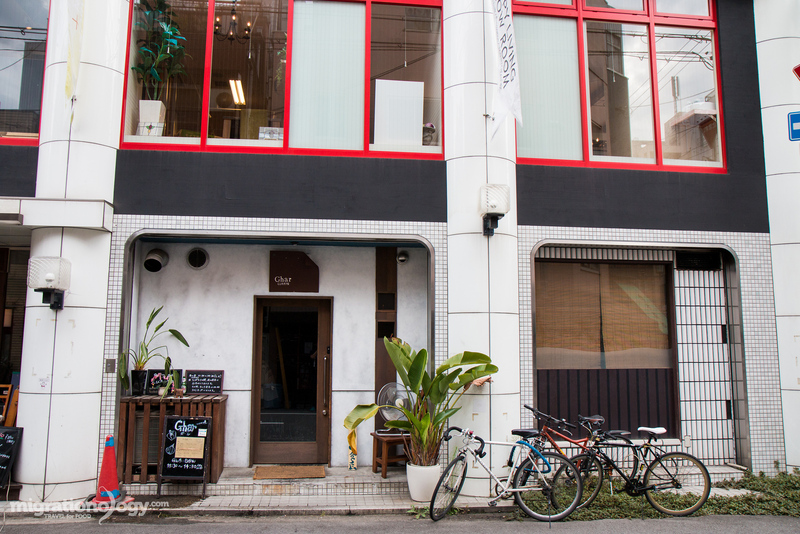 When we get back to Tokyo we have a few more of your recommendations to visit as well. Thanks for maintaining your blog, it’s such a great source of information for those of us who, like yourself, feel that food is the best reason to travel! Hey Stacy, so cool, thank you very much for sharing, and I’m so happy you enjoyed the food. Thinking about that beef and that chicken have my mouth watering right now. Have a great remaining time in Osaka, and enjoy that sushi for me! Hey Sharon, you’re welcome, glad it’s helpful. Love your Channel Man!! Good to know there are Food Lovers like you 🙂 . You Rouse To great Heights with your passion 🙂 !! Cheers Mate!! Thank you very much Sangeet! 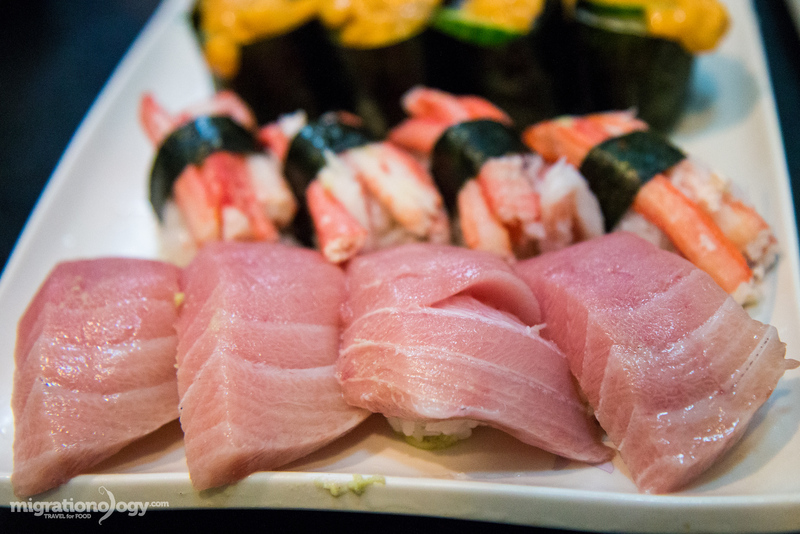 I had an incredible dinner at Harukoma last year and I’m glad you featured it in your blog. The wait was long but it was so worth it. I had one of the sushi set and the egg omelette sushi (tamagoyaki) was superb! I found that Osaka food generally has a richer taste than food in Kyoto and Tokyo, which suited me more. I’ll be sure to check out some of the places you’ve suggested in my next trip to Japan. Hi Mark! I watched all of your Japan-related Youtube videos in preparation for my trip. The videos are so helpful and entertaining. You have a knack for choosing the best words to describe food. Thank you for making and posting the videos. Hello Mark! 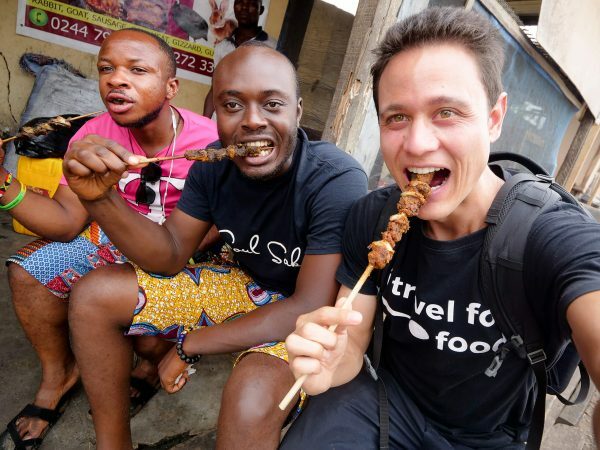 Love your blog, very informative and I adore your visuals 🙂 We recently launched the world’s first online platform called visit.org, where you can book tours and activities with nonprofits, and at the moment we are giving away our cookbook with recipes from nonprofits for free to everyone who signs up here http://bit.ly/1WESVQ1 ! We would be honored if you could check our recipes! 🙂 Thanks! Thanks for delicious recepes and presentation..Are there reasonable priced Kobe beef restaurants in Bangkok? great info OSAKA food scene looks fantastic. We are traveling from Australia to Japan next year for the first time but my vegetarian food loving husband is starting to freak out with all these pictures of sushi….whats the menu for vegos? I will be heading to Japan for the first time and a foodie like me has hooked up to your blog and videos..! Thanks to your work I have clearer picture what to anticipate..Awesome work! Japan here I come! Hey Shirley, great to hear you’ll be visiting Osaka soon. Glad this guide will help. Hope you have an amazing trip and enjoy all the delicious food. Wow! The mouth-watering dishes are just amazing! All thanks to your great and informative post that whoever plans to visit Japan will know very well about the multiple dishes that one can try. Wonderful photographs are like icing on the cake! Thank you very much Abhilasha, really appreciate it. I am freaking starving now – thanks, good to know that Osaka is more than sushi and rice! Hey Adam, thank you for reading, glad this post made you hungry! You should change Sanshu Udon to Sanshyu Udon. Sanshu means 3 kinds, and Sanshyu is romantic ways to call Kagawa prefecture. Kagawa’s other nick name is Udon prefecture. Also Koga Ryu should be Kouga. Koga is usually family name and Kouga is the area that known by home town of ninja. Izakaya at Namba is Shimotaya. Hi Toro, thank you very much for your useful input. Ok, I will get that changed now. Appreciate the help! Hey Yuri, great to hear from you, thank you very much. What part of Japan are you from? Do you go back to visit often? Thanks Maks for such a wonderful blog, your photographs almost bring the food alive. I recently spent a week touring the Kansai area with Osaka as my accommodation centre. You make it all look so simple……..
Hi Michael, thank you very much, really appreciate it. Glad you just spent some time in the Kansai region as well – such an amazing place. Thank you for the tips, next time I’ll definitely go into the garden! Hey Adelin, good to hear from you, and happy to hear you’ll be taking a trip to Osaka soon. Hope you have an excellent trip and enjoy the food! Hey Aaron, great to hear from you, thank you very much. Hi Edward, thank you very much and glad to hear this Osaka food guide is useful. Yes, I’ve also heard about the other wondrous kinds of Japanese beef available. Unfortunately I haven’t been able to try them yet, but on my next trip to Japan, that will be my goal! Thank you for your support. I love your latest videos on Osaka! You should host your own travel show! Your passion for food is infectious! Thank you very much Gwen! Everything looks wonderful! I’m from Osaka living in LA. Next time I go back I want to go to all the places you went! Great job Mark! Thank you very much Yoshi! Hey Mark, I am really a big fan of you. I am going to visit Japan next month for two weeks and specially Osaka for 3 days. I am really excited about my trip now and I want to some food what you listed here. We’re landing in Tokyo and will slowly make our way to Kyoto and Osaka! Can’t wait to eat!!!! Always love to see your youtube VDOs! It’s such a wonderful experience to read your blog and watch the videos , it inspires me to travel for food. But how do you manage to be so fit after eating . You look so fit in the videos. Hey Aqheel, good to hear from you, and I’m glad you love to travel and eat as well. A for staying fit, I try to stay away from sweets, most drinks other than water and coffee, and also mostly packaged / processed foods. Other than that, I also love to exercise and keep active, and also probably a bit just runs in my family. This is one of the best place you have been to & I’m full after dinner but my mouth is watering after today’s video. Keep up the great work mark ☺watching your upload is a highlight of my evening’s. Mark, thanks for the blog and videos. They’ll be very helpful for our upcoming trip! By the way, as far as I can tell, the name of the izakaya you went last in Osaka in Doguyasuji is Shimotaya. I hope this helps! Hey Luigi, great to hear from you, and thank you very much for the information about the last Izakaya restaurant, really appreciate that, and I will update the guide. We had no idea where we were going on that last night, and most of the izakaya’s were all full at that time because it was right around 7 pm when we went… luckily that place had 3 empty seats and we jumped on them. It was fantastic. Again, thank you for the helpful information. Really well written and entertaining read, Mark. Just wanted to say, as a stressed college student, watching your daily vlogs are always a highlight of my day. It’s almost like I’m travelling the world with you. Now, that you’ve conquered Japan, where are you headed to next? Really cool to hear from you, and thank you for watching our videos and reading the blog. Not sure yet, but I’d like to go to Indonesia soon. Thank you for introducing Japanese food. Please put soy sauce on a natto roll and negitoro. Hi Osamu, thank you very much, and thank you for the tips as well. Ok, will do for next time for sure! although the explanation is in Japanese, you can emagine regional foods from those pics. and sake, ume-syu (Japanese plum wine), sake shochu which is clear liquor distilled spirits from sweet potatoes, rice, buckwheat, etc. or onsen all over Japan. Thank’s for introducing lots of Japanese cuisine. I’m from Osaka, so glad you came and tried many good foods there. wihich is cheap snack for kids or students who don’t have enough money. it looks similar a Mexican taco and convenient daily snack for ordinary people in Osaka. like a hot dog or taco. which is near Tsukiji fish market in down town Tokyo. Tsukishima is a famous area of lots of monja restaurants on the streets. I know it doesn’t look good,but so tasty. I’m sure you ‘d love it. you might know we have a big diffrent taste of food between Osaka and Tokyo, or east and west of Japan. especially, soup broth of udon or soba and tamago-yaki which is kinda Japanese square formed omlet. please find out when you try them next time. when you have opportunities to visit there, please try some of them or more. thenk’s for reading long comments. to introduce for foreign tourists of Japan. Thank you very much for the kind and thoughtful message, and for sharing all the extra things to eat. I still have so much to come back to Japan for to eat! Next time I visit Japan I’d really love to visit some other regions and explore the local food, and especially get out of the main cities and be more in the countryside. Hi Mark, video and foods look so insanely good. I enjoy and thank you so much. great as always. Tomorrow my wife and me will fly to Japan. Yakushima and Tokyo. Yoshihashi is on the list! We would never know this place without you so thank you very much. A few lines down, you wrote that you like to visit Germany sometimes. From my side it would be very cool if you and your wife want to stay in our house for a few days. Of course for free. We live near Frankfurt. You can go there directly by train. So if you plan something around Frankfurt and want to safe the money for the hotel let me know 😉 You got my Email now. Please keep up doing what you do. We love to watch. Hi Daniel, good to hear from you, and glad you’ll be going to Japan soon. Thank you very much for the invitation to Germany and to stay at your place, really appreciate it. Will definitely remember if we make it to Germany. Have a great time in Japan, and greetings to your wife. Japan has so many awesome things going for it, but the food is definitely my highlight!! Hi Rebecca, glad to hear you love the food! I wonna talk about that restaurant that had fried stuff on sticks..
Why not the double dip Buddy :/ it was yours and ying’s right? Hey Bryan, Great to hear from you, thank you very much for your support, Ying and I appreciate it. As for the sticks, I believe it’s because the sauce is communal and shared between many people. But they also had cabbage on the side that you could dip into the sauce to get more sauce and then add it to your skewer. Thank you again! I came across your blog series as we are Taiwanese and the videos you produced during your stay was excellent. Homesick! This is one of the best food blog post I have ever seen. Keep up the great work. Hopefully one day, you could arrange a trip to Vancouver, BC, Canada. Great foodies here as well. Hi Lawrence, nice to meet you, and thank you very much for reading my blog. My sister went to University in Vancouver and I went to visit her once, about 12 years ago now, and I loved it. I would love to go back again, the mix of food available in Vancouver amazing. Thank you again for your support. Love all the photos and videos you made on Osaka and Tokyo. Some of these food places recommendation, especially the diners, really help me in planning my November trip to Osaka and Kyoto! We’ll definitely check out the takoyaki places and the diners you visited! Hi Mandy, thank you for the comment, and glad this food guide is helpful for planning your upcoming trip to Japan. Hope you have a great trip! Thank you very much Sophie, really appreciate it. Hey Mark, I am a avid follower of your articles and youtube. You’ve been such a inspiration for foods to try when i’m in Japan (i’m there next week for 3 weeks!!) I wanted to do a food tour but they were to expensive so a friend of mine suggested I make a list of foods and go out and find them during my trip..so without you the list would be quite short. Thank you!! Hi Marie, thank you for the comment and really appreciate your support on the blog and watching our videos. Glad you’re in Japan now, enjoy the food! Hi Irwin, haha, thank you very much, and so cool to hear about your son. We’re hoping to have some kids in the future, I hope. Greetings to your whole family, and thank you all for watching our videos. Thanks so much for all the helpful info and videos !! Really enjoyed them. We gonna be in Osaka and Tokyo in 4 weeks , really excited to try all these food!! You’re welcome Lyle, thank you for watching and following. Have a great trip to Osaka! Hi J, good to hear from you, thank you for watching our videos. Osaka in general is a really nice city, but a good area to base yourself, for transportation / food / entertainment is around Umeda or around Namba. Thanks! Hi Mark! I love watching all your videos! Especially the ones about japan. My friend and I are leaving for japan in November, so we’ll make sure to stop at some of your recommendations. The kobe beef on top of our list ;D. Thanks for the blog. Hey Emilie, thank you very much, and that’s great news you’ll be going to Japan soon. Hope you have a great upcoming trip, and thank you for watching our videos. Great blog post! I hope to travel to Japan one day and experience all of the delicious food that you had. Keep up the great blog posts, they are much appreciated. Safe travels and God bless you and Ying! Hey Koopy, thank you very much, really appreciate it! I love watching your YouTube videos! Those are all the foods that I love eating. My girlfriend laughs when I make the orgasmic expressions when I enjoy my meal. Also I have a man crush for you. Haha, thank you very much Chanthi, and so glad you can’t resist the delicious faces! I love watching your videos! I’m traveling to Japan with my boyfriend in the winter, and we’re definitely using your videos and your blog posts as a guide 🙂 Thanks for creating such awesome material! Hi Yuan, nice to meet you, and thank you very much for watching our videos. Good news that you’ll be visiting Japan soon as well. Hope you have an amazing upcoming trip! Always been watching your vids, love your pictures. The pictures looks amazing mark. Surprised you have time to take pictures and capture your moments via video. ! btw, how easy is it to communicate in english in japan? i want to go Osaka one day.. and vist the castle…as well as the tuna place you went to in the market. Your one of the peeps which gives a true representation how places look like how locals eat as well as reviewing delicious and reasonably priced food. keep up the good work mark! Hi Timmy, thank you very much for your kind and encouraging words. As for communication, sometimes it definitely can be challenging, but I think the main thing to do is just go for it, and just take your time figuring things out slowly, and also be very flexible. Sometimes I had no idea what I was ordering at restaurants, but it always turned out good in the end. In Japan most of the signs are Romanized, so you can usually find signs to the place you need to go. You will be fine when you go! Wow! Everything looks so good! Can’t wait to eat all that great food, we leave for Japan next Wed! Thank you Lynn, have an amazing trip to Japan! IS there a video on harukoma? Hey G, it’s still coming, will be on Day 12 of the Osaka videos. Hi, Mark ! Awesome food ! I love the passion that you have in what you do ! Keep up the good work ! My husband and I love your video and vlogs! You have such an honesty to your reaction to everything you eat, keep up the awesome work! Nice to meet you Cristina & Vo,thank you very much for following, really appreciate it. Hi Ellis, thank you very much, and so cool to hear you’re going to Japan tomorrow. Hope you have an amazing trip and enjoy all the food! Hi Julia, that’s a great question, and I will try to write a few more posts regarding this. Definitely Japan is not the cheapest place, but I think food and attractions can be affordable, and so the main expenses are accommodation and transportation. Will write more soon. Thanks! Look naturally gorgeous. The food is extremely fresh but the price is so high. Next summer, I planned to visit Japan for two weeks, with about 5 days in Osaka. Initially I thought that it might be too long to stay almost a week in Osaka, but after seeing all this delicious food available, I’m starting to think 5 days won’t be enough! THANK YOU MARK for this very informative and interesting read. Hey Morris, if you enjoy eating, you’ll be able to keep yourself very busy and happy for the full 5 days in Osaka. Hope you have an amazing trip! I am a long time viewer of your YouTube channel and this is my first post. Like many of your viewers, I long to travel and experience all that the cultures and countries I travel to have to offer. You have allowed me to live vicariously throughout your travels and have given me countless hours of enjoyment. Your Osaka trip was no different! I wish you all the foodie joy that this world has to offer! Safe journeys! Hi Mike, thanks for stopping by and for watching our videos for so long. Glad you enjoy traveling, learning about other cultures, and food as well. Thank you for all your support! Thank you Chizuru, I hope to come again! Absolutely marvellous! It’s almost 23:00 in Europe and even though I had a hearty dinner I began to crave some Japanese titbits. And you’re so right about travelling to a destination just because of the food. Last year, I took my husband and son to Thailand, Inodnesia & Korea, and all our son could think of was having “real” sushi. And so we did! He’s very into Japanese culture at the moment and ihas been learning a bit of Japanese LOL! Hi Victoria, thank you, and glad we share the same view that it’s worth traveling for the food. Also, cool to hear your son enjoys sushi, fantastic! Thank you very much for a GREAT INFORMATIVE about Food in OSAKA. You also have a GREAT PICTURES !!! Looking at your pictures, make my saliva drooling !!! 1) I really like Oden … but I am not quite sure what type of soup based they are using. 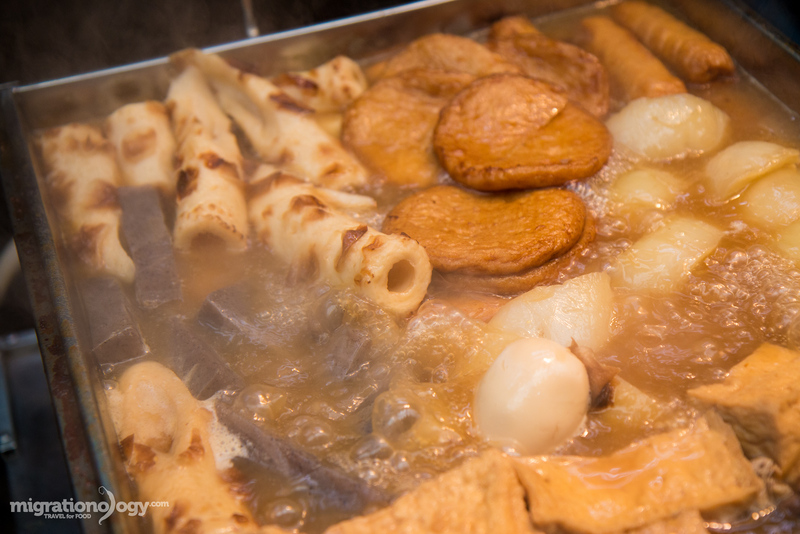 With my limited vocabulary , it seems that the Oden is meatfree based … do you know what are the ingredients for the soup based? Hi Ghazali, nice to hear from you, glad you enjoyed this food guide. For oden, I’m not fully sure, and it could vary, but I think it’s typically dry fish stock, but not meat. However, like in the one pictured, they did have beef skewers cooking in the broth. I didn’t do too much research when I was in Osaka, but I believe there are many Halal restaurants. Are you able to eat most seafood? Hope this helps, and hope you’re able to visit Osaka in the future. I watched all your Osaka videos and it makes me want to go there myself so so badly. Japanese cuisine is well-known of its quality, everyone knows about that and say the same about it. Often hear people saying, just walk into any random restaurant/cafe in Japan, it will be good. Hard to find something that taste bad. But to be honest, yes, the price is what stopping me. I know it is going to be worth it but then, still have to save more and perhaps one day go on impulse, like you! Thank you for bringing us around Osaka (virtually), I hope one day it’s my turn to come. Continue to great work! Cheers from Singapore. Hi Viola, great to hear from you, thank you very much for watching. I understand about the price. I had wanted to visit Japan for many years before going for the first time as well, and it was largely because I had to save up before going. However, even though it can be expensive, I think there are really some great deals on food, and also for accommodation we rented an Airbnb apartment for 4 of us, and it cost $80 per night – so that’s pretty good for 4 people. And also, I think if you try to visit many cities in Japan quickly, that’s when things get really expensive, but if you choose to just stay around the Osaka area, it’s much more affordable. Hope this helps, and hope you can visit Japan in the future. Hey Gareth, thank you very much, haha, no raw chicken for me in Wales! Have a good upcoming trip to Thailand, thanks! Hi Izumi, nice to hear from you, thank you very much for watching our videos. I use Adobe Premiere CC for editing. your pictures of food are so tantalizing, I just wanna gulp down everything. I was in Tokyo and Akita when I was in Japan, I remember Tokyo being very expensive, I was plagued with indecision when I have to eat. Osaka prices seems a bit more reasonable. I saw your video on your arrival and the chicken sashimi, I kept thinking how can you eat raw chicken at 3am when your stomach is half a sleep and hungry. I am so happy for you and your wife able to go anywhere on the spirit of the moment, and enjoy life’s every niceties. I certainly found joy just watching it. Hi Mary, thank you for reading and for watching our videos. I think overall Osaka is a bit more affordable than Tokyo, and I especially found that with accommodation as well. Haha, oh yah that 3 am chicken sashimi! I find your recommendations on food very interesting.When I am in Japan I shall visit and taste all what you written about. Hi YC, thank you very much! Hi Lee, thank you very much, really appreciate your support. Greetings to your friends as well! Great post and videos! I have really enjoyed! I recommend the following very small restaurant as Kappo. 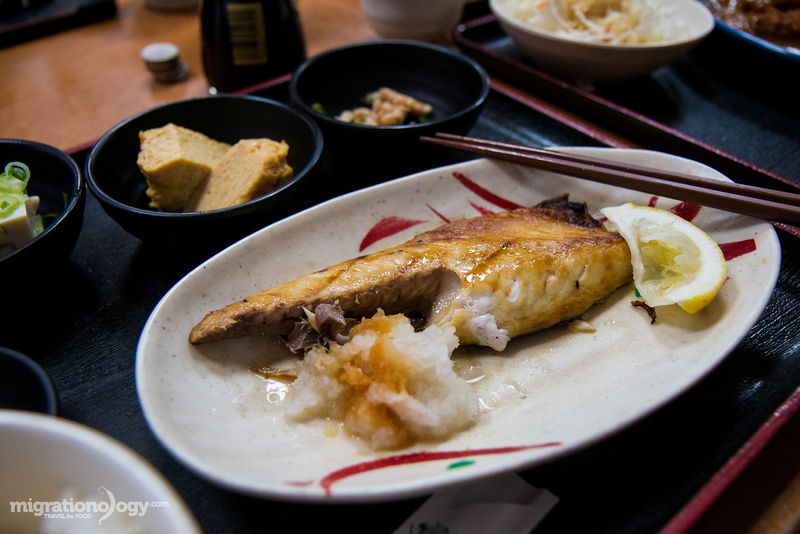 You can enjoy Japanese dishes at reasonable prices there. But the staff cannot speak English and serve of foods may be slow because a cook is only one. And… The box sushi is Hako-zushi not Kako-zushi. It’s a typo. Hi Peter, thank you very much. Excellent, thank you for the Kappo recommendation as well, would love to visit when I visit Osaka next time. Will fix that typo now. Perfect timing! I am heading off to Japan for 3 weeks in March/April (including Osaka to watch the sumo tournament) and this guide is just great. Hi Fabian, great to hear that. Oh excellent, have a fun time in Osaka and enjoy the sumo tournament. Thank you for documenting my next food trip! Question here from Cali, is Kobe beef gamey at all? I’ve had American Wagyu but I wasn’t a fan, but it could be the restaurant and how it was prepared. I like prime beef aged less than 28 days, not too strong. I watch every video, thank you so much for your hard work. Hi Jeunesse, thank you very much for watching. In my opinion I didn’t taste any gaminess (a little perhaps in the dry aged meat mentioned), but not in the typical bbq yakiniku style. It’s more of a mild beef flavor, but an extremely buttery texture, paired with the beef oils and juiciness. Are you planning to go to Japan soon? This is awesome. Thanks for sharing as my family will be visiting Osaka form 28 March to 5 April next year for the Sakura experience. We certainly love Japanese Food and you sharing is most helpful to us. Anyway we can download this information onto PDF format as I want it stored into my ipad when I visit Osaka? Thanks Mark. Hi Jeffrey, glad you’ll be visiting Osaka next year, and I think during Sakura will be a wonderful time. I haven’t yet had the time to make this into a PDF, but perhaps I’ll put that together in the next few weeks. Thanks! you are not new to my family. I have been following you for a long time. Your video blogging has tempted me and my wife to Visit Japan. My wife wants to visit Osaka first because she thinks she knows Osaka In & out thanks to you :). We both are waiting for you to make some VLOG on united states visit, it will give us different perspective :). Hi Amogh, thank you very much, and glad you and your wife would like to visit Japan and especially Osaka. When I visit the US next, I’ll try to do some vlogging. Greetings to your family and thank you all for watching our videos. When you feel like getting your kicks with spicy food, visit Magic Spice and have a bowl of their Indonesian-style soup curry where you will discover a new horizon of spices. The food might not be the same as what comes to your mind hearing “Indonesian-style”, but it’s still great. Probably Magic Spice is one of the most renowned eating spots among spicy food lovers like you. To me, they surpass other averaged curry restaurants not only in spiciness but also depth of flavor (the exterior and interior of the place also goes far beyond others, by the way). I’d have lunch at the place every day-off with my face towel for wiping water-fall-like sweat on my face while eating my favorite chicken soup curry at “Raputa” level – they categorize the spiciness into seven or more levels. Their restaurant is located on Naniwa-Suji street which is a little bit far from Namba Station. They also have branches in Tokyo and Nagoya as well as Sapporo where their original restaurant is situated. Give it a shot. Hi Yoiyoibei, thank you very much for the recommendation, that looks delicious. Unfortunately, we just left Osaka, but I will remember this place for next time. Thanks! Mark, I’ve love your videos and blog. You inspired me to be a food blogger but I don’t know how to start. Hoping someday I can make it. Good luck to you and God bless. Hi Jecterz, thank you very much, appreciate your support. Have you already started a food blog? If not, this post might help: http://migrationology.com/2015/04/how-to-start-a-travel-blog/ Thank you! Thank you for Awesome food and traveling guide. I am a Japanese in north part of Japan. I always enjoyed your huge smile reaction to every foods. There are many foods with local character at many cities in Japan. I hope you and Ying will enjoy many foods and cultures in Japan. Hi Jun, nice to meet you and thank you very much for watching our videos. We really enjoyed this trip to Japan, both the food and the culture. I hope to visit the northern part of Japan on our next trip! Hi Mark, I am Christie from Kuala Lumpur, Malaysia. Can you include coordinates for all the places you went? That would ease a lot of for us to find these places. Would you blog on where you been visit? I will be going to Osaka, Kyoto, Nara next year April. Hi Christie, nice to hear from you. I’m working on a map right now, it’s not fully complete yet, which is why I didn’t yet include it, but as soon as I finish it, I’ll post it into this Osaka guide. I visited both Kyoto and Nara on this trip, but didn’t do too much, but I will be posting about it soon. Glad you’re going to Japan next year! Hi Ryan, good to hear from you. Thank you for watching all of our vlogs. Oh cool to hear about your okonomiyaki experience. Do you remember which restaurant you ate at? It’s called Chibo. Check it out next time your in Osaka. Mark, all your videos make me smile, and I always feel glad for you. I went to Japan in May of Tokyo, and we did not know what to do until we stumbled across the first video I watched. It was the top 25 things to do in Japan, and that was like a tour guide for me! I wish I tried some of that Okonomiyaki, but enough about me. You are my favorite food blogger and it makes me feel famished even after a meal! Keep up there work Mark! Hi Christian, nice to meet you and thank you very much for watching our videos. Glad you had a great previous trip to Japan, and enjoy the food. 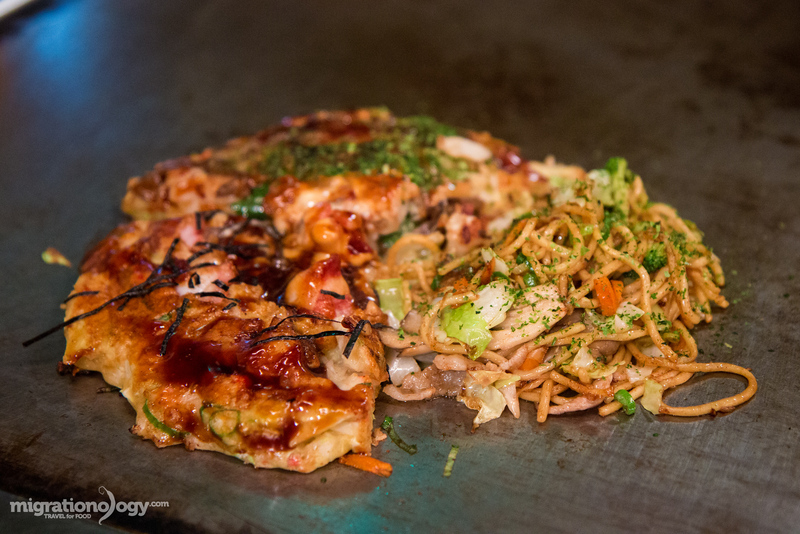 You can always try some okonomiyaki on your next visit! Thank you again for your support. It’s always a delight to read your posts. Can’t wait to go to Japan next year! Will be keeping this guide handy! This is just one of the few (as well many other) reason Japan is on my bucket list. This county is “awesome!” Also come to New York City. Cool to hear that Mike, I agree. Thank you, I would love to. Thanks mate. I have been dying to return to Japan for a food tour, but it is so big. .. The cities and a little daunting. Can you recommend a particular area to stay in osaka. … you know, well placed to access the places you have reviewed? Thanks. Always enjoy your work. Hey John, the two main hub areas of central Osaka are Umeda / Osaka Station, and the Namba Area. I stayed for a few days at each location, both are good, offer plenty of choices for food and things to do, and transportation all over the city and Japan. Thank you for following! I don’t normally write reviews and such , but dude you are killing it. Your blogs and videos are fun, informative, and such great care and skill go into the editing. I went backpacking around Southeast Asia last year and soon I’m going to see more of Thailand and then do a couple of weeks in Japan. Your videos are like a godsend. Truly helpful. Your review of P’Aor in Bangkok basically made me buy a ticket to Thailand… Thanks so much and keep doing what you do! I expect you’ll have your own show on some travel network soon. Hi Sean, thank you for the hugely encouraging comment, and I’m so glad to hear the videos and blog posts are helpful. Awesome that you’ll be coming back to Thailand again. How long will you be in Thailand? Will you be traveling more about SE Asia? Love your review Mark!! Will definitely try them when I’m going to Japan (hopefully soon!!). Keep on traveling and blogging. Hi Niall, great to hear from you, thank you watching our videos, and for checking out this guide. Glad to hear you’re eager to travel to Japan for the food! Hey Mac, thank you for sharing. I’ve actually been to CoCo, but at a branch in Bangkok, and I think I went with something like an 8 or 9 as well, but should have gone for the 10 too. Next time for both of us! -thaks for videos and great reviews…. Hi Christian, haha, traveling to Japan for the food is definitely a Happy Birthday moment. How long will you be in Osaka? And will you travel around Japan as well? Really depends on what type of food you’re most interested in, but I really recommend those first few sushi restaurants at the top of this Osaka food guide. I just want to say your content is just getting better and better. You have had an action packed year so far from the Philippines to Taiwan and now to Japan. Kudos!! I eagerly await more vlogs from your next destinations as well. Take care and best of luck to both Ying and yourself. Hi Jehan, thank you very much, we really appreciate your support, and I will tell Ying as well. Hope you have a great day! Mark, we first watched your videos before our journey 19 months ago and they led us to many delightful food places. Kuala Lumpur was a treat. We also went to Japan and Taiwan for a month each-and we enjoyed some of the food you are enjoying too. Your amazing blog, still continues to deliver…enjoy! Hi Tenzing, thank you for the comment and for watching our videos. Glad you enjoyed Kuala Lumpur, as well as Japan and Taiwan – so many great food destinations. Nice to see your blog and your story as well. Greetings to your family! Congrats for the blog and the youtube videos. Impressing level of detail, great pictures and data. Just a commment about you guys eating raw chicken (sashimi) . Amazed you are not afraid of possible health risks since chicken develops dangerous bacteria very easily. Not concerned? Hi Tony, thank you very much. I wasn’t sure when I was eating it at the time, but just went with it. But since posting the video, many have re-assured me and others that the chicken production for sashimi grade chickens in Japan is handled in a much different way from chicken production in other parts of the world. So I think as long as you go to a specific chicken sashimi restaurant in Japan, it’s not a concern. We can’t stop watching your videos over and over again! 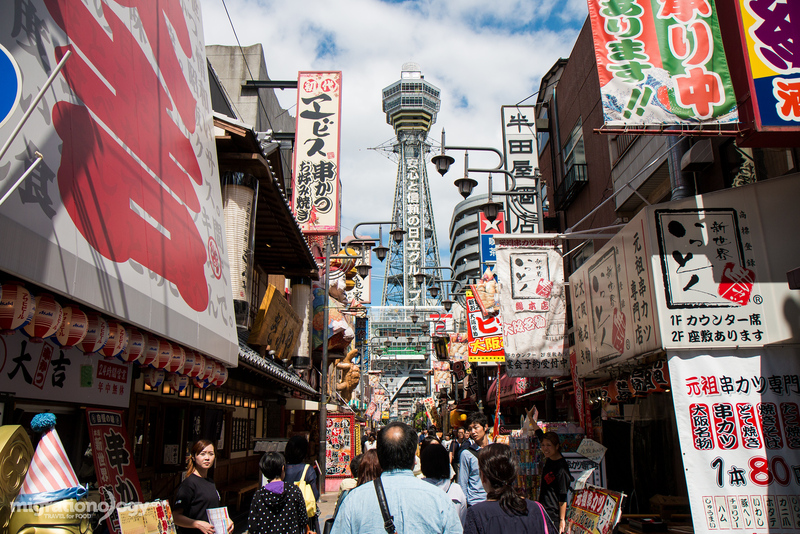 Osaka will be our next stop in 2016 (already went to Tokyo last year). Keep up the fantastic work and passion. Hi Magda & Sylvain, nice to meet you and thank you for watching our videos, we really appreciate it. Glad you’re planning another trip to Japan soon! ohhh gosh. i have to bookmark this page!! the photos look great; i’m sure the food tasted better. definitely japan is one of priorities for travelling to in the next few years. Thank you very much Gloria, hope you can visit Japan in the future! We leave for Japan in a few days and I am looking forward to some awesome eating!! I definitely enjoy your blogs and can’t wait to go back and participate in some kuidaore. I did get some helpful hints for my upcoming trip and can’t wait to try some of the places you have mentioned! Hi Kelli, excellent, glad you’re going to visit Japan in a few days. Enjoy the food, and I hope you don’t spend all your money! That was a long but very easy to read blog post. Loads if good information and very good food shots. I do not get time to travel but it is because of people like you there are so many new things and places I get to see. I keep looking for new vlogs from you. Thank you and keep up the good work. Hi Lester, thank you for reading, glad you enjoyed it! Always love your blog and always take recommendations from your videos if I am going to a new place which you’ve been to! I know you’ve been to Kuala Lumpur but please come again and have a meet and greet! Hi Samia, thank you very much. Sounds good, definitely when we visit Kuala Lumpur again, we’ll let you know! Mark and Ying, I love watching your food videos and my 4-year-old daughter is a huge fan too! She would rather watch you than Disney, Sesame Street, cartoons, or anything else 🙂 This blog post is amazing! Japanese food is so beautiful, like art work! I would love to visit there someday. Hey, next time you’re in the USA, please come to Oregon! Hey Evelyn, we really appreciate it, haha, your daughter is awesome. Ok, next time we’re in the US, we’ll try to visit Oregon, would love to. Say hello to your family and give a big hug to your daughter from Ying and I! First of all, I would like to Thank You for this Insightful and Beautifully Written Blog Post. I really enjoy reading it ( Actually I’ve read it TWICE to sink the information in really well ). Throughout my reading my mouth is actually watering and those photos My Goodness! Hi Thiha, nice to hear from you, and thank you very much for reading and sharing this food guide. Haha, glad it made your mouth water. Nice to see your blog as well! I’m very surprised you were in Osaka. I think you definitely enjoy Osaka and Kobe food. As I mentioned before, You love Kansai food more than Tokyo food. Because most of food are very delicious and cheap. But you still walk around expensive area, Shinsaibashi and Umeda, in Osaka. Next time you should walk around Tenma and/or Fukushima area in Osaka at night. You can find easily a variety of nice restaurants. I really recommend. Hi Tadaharu, nice to hear from you, and thank you very much for the local recommendations. I will definitely remember for next time! Thank you very much Jing! Hah, thank you Bruce, that sounds about exactly like what I do when I think about tuna as well! Hi Toki, good to hear from you, and glad some of the seafood dishes looked good to you as well. Even without the seafood, there are so many good specialities in Japan, I know you would enjoy it. Hope you have a great day also! Hey Mark, I’m so glad you just did Osaka. I’ll be going there in early December, so I’ll definitely try some on your list with the limited time I have there… Cheers! Hi Simon, thanks for reading and so good to hear you’ll be visiting Osaka soon! love your videos and I enjoy watching it everyday!!!! thanks for the vlog!! As per your recommendation/video, I went to TayuTayu one night right after trying Kiji, for which I didn’t know you went there as well ! Kiji was packed when I went, so the staff and chief were under water, I had to wait 1.5 hours before getting served. But worth the wait anyway. Anyway, back to TayuTayu, it was… incredible !! I had first ordered Set 2 of the Skewers, and the house specialty Meatballs. Man, I died on the spot eating these. 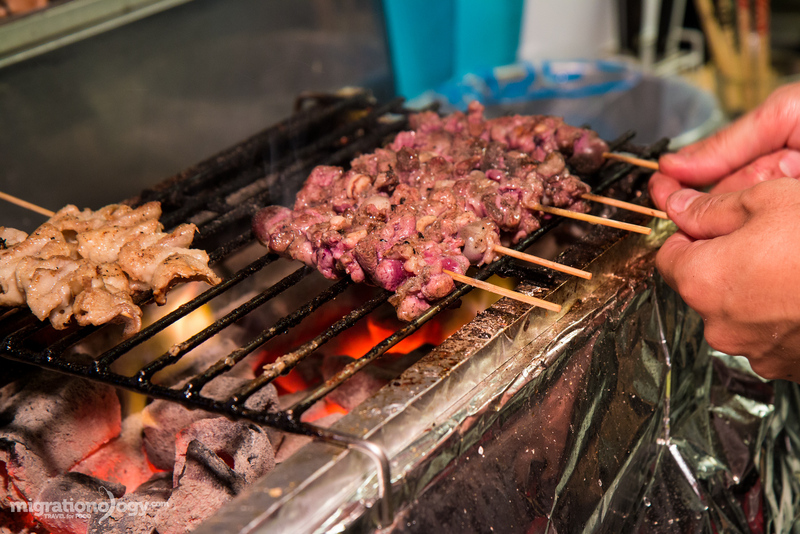 The skewers were beautifully cooked and done, a real feast. So I also ordered Set 1 afterwards, which was on par with Set 2. I would have like to try more, but alone, it’s a bit difficult to eat more than that after a complete okonomikyaki as well haha I think the japanese menu has more choices but well…the Sets were already good choice to begin with. Anyway, great great location ! I also recommend for people interested. I would definitely go back there if I travel back to Osaka. Hey Adelin, wow, this is amazing, thank you for sharing, and glad you had such a good time in Osaka as well. Glad you enjoy Tayu Tayu, a fantastic little place – such good food and friendly service. True about the menus, I was always wandering what we were missing out on with only half the menu in English, but nevertheless, such excellent food! Hi Mark ! Love your blog. ..and so much now that I am working for an International Boarding g School here in Canada .I am in charge of one of the Cooking Clubs .Most of the students coming g from Asia . Every Thursday is the class . Thanks a lot for show me such a big variety of Asian food …this week our recipe is a desert but I can’t wait to try to make sushi or one of those delicious kabbots! Gracias ! Hi Cristbal, nice to hear from you, thank you very much for reading. Glad you are in charge of a Cooking Club at the school, that’s sounds like a lot of fun and a good food experience. Enjoy the dessert and the sushi! HI Mark ! A huge fan of your YouTube channel! This guide is very useful for my future trip! By far the best food blogs I’ve seen ! It’s very informative and yoh make it look so scrumptious ! Once again well done ! Hi Rima, thank you very much, we really appreciate it, glad this will be helpful on your future visit. Thank you for the videos and blog.i really really enjoy watching it.???? You’re welcome, thank you very much for watching. Wonderful food! I have never been in Janpan but will do in near future. Japanese people is sooooo nice… I have a freind from Japan who lives in Bangkok and Sweden. Thank again for you nice video from Japan. I love Japan! Hi Khun Oranuch, nice to hear from you, glad you’ll visit Japan soon, I think you will enjoy it. Hope you’re doing well! Hi Zachary, thank you very much for your support, really appreciate it. Was planning my maiden trip to Tokyo, with a quick peak at Kyoto & Osaka. This writeup couldn’t have come at a better time after the mouth watering article on Tokyo. Hey Ken, glad you’re planning a trip to Japan! One of my top 5 vlogs series so far ! Many thanks for the blog and you vlogs, I really enjoy visiting these places through your eyes and taste buds 😉 ! I now know for sure where to land first if and when I’ll visit Japan ! Hi Diego, thank you, really appreciate your support watching and reading. That’s a good choice for a first meal in Japan! planning to visit japan next year, love to hear about your blog, thank you very much. Good to hear that Toh! Hi! Awesome guide! I’m starving just reading it! One of my food / cultural travel destination dream is Japan, Osaka por food, Tokyo for tech and some smaller cities to dive into the ancient local culture. Now I have thanks to you, a lot of good places to visit when I finally take my vacation and make this trip. Thank you a lot and keep doing this awesome job. Best regards from a fan from Brazil. Hi Thiago, nice to hear from you, and that you’re planning to visit Japan in the future. That sounds like a good choices for places to visit. I haven’t had a chance yet to go to any smaller towns / villages, but that will definitely be on my list for next time I visit Japan as well. And I hope to visit Brazil in the future as well. Mark, thank you for your Osaka and Tokyo Food Guide. Right timing too as I am thinking of going to japan next year, God permits. All those sashimi especially your picture of the UNI really made my mouth water. They looked so fresh and the tuna….UNBELIEVABLE! Would you also have a tip where to stay at affordable places? I’d rather spend my money on the food rather than the accommodation as long as it is clean. I will be travelling alone and I just love Japanese food, not too much on the ramen though. I always look with anticipation whenever you post something. Next time, maybe you can organize a food tour in Japan and I’d be your first customer. Hi Rosita, you’re welcome, glad this is helpful. Visiting Japan for the food is well worth it! The entire time we were in Osaka, we stayed at an Airbnb rental apartment for about $80 per night, but we were with 4 people, so it was really a good deal. For one person, not so good, but you could definitely give it a search. For Tokyo, my wife and I stayed at Oak Hotel, pretty good place on a budget. Thank you, a Japan food and travel tour would be really cool! How do you eat so many yummy foods and still keep your figure!! Awesome blog!!! Love the photos! Going to definitely check out the vlog….. Thank you Fela, we had to walk to all the restaurants! Thanks a lot, Mark!! This is so helpful and I alr added this as my fav guide for my future traveling to Osaka????. I thought Kobe beef was very expensive, but I was surprised after I saw the prices at La Shomon. Definitel in the list of eating the luxurious delicious beef! Hey Jenny, thank you very much, glad this is helpful, and hope you can visit Osaka in the future. La Shomon has extremely reasonably prices, one thing is because they are located a bit outside of the city (about 20 – 30 minutes from the center or Kobe), and they are catering to local a local crowd, instead of right in the middle of the city. It’s a fantastic restaurant. 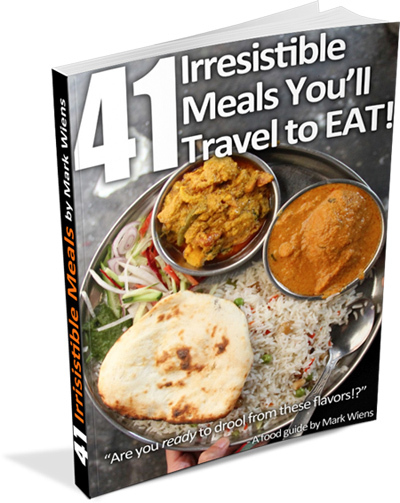 What can you say, migrationology.com is the best ever Food Guide. I am a very big fan of your YouTube videos and your Food Guide. I try to not miss any part of your blog. Each of a food lover, and likes to go on trips should look your blog. I wish you well, go on like this. I really admire everything what are you doing. Hi Joschi, I can’t thank you enough for all your support over the years. Also, thank you for the encouraging words! Japan! Wow, it is sure a wonderdul country and with so much great food! From what you wrote and showed in the videos so far, the Kobe beef and the Japanese curry seem to be the best speacialties of Osaka. I did not know Ramen (Cup Noodles) was invented in Japan, I thought this instant food was from China. 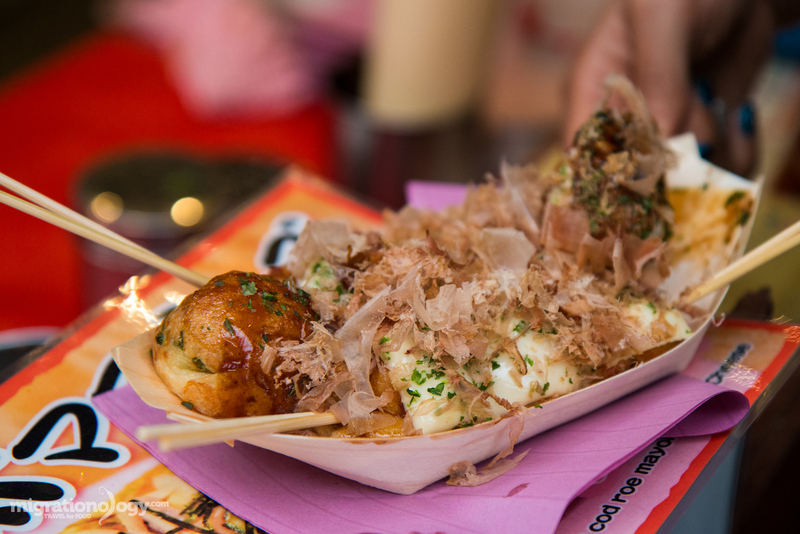 One question: is takoyaki the same thing as a Hong Kong dumpling? I have never eaten none of them, but as far as I could see, they look, to me, pretty much the same. Am I correct? Hey Bruno, good to hear from you. The takoyaki are very different compared to Chinese dumplings. Takoyaki are more like pancake batter balls, and they are kind of runny inside and solid all the way through. Hong Kong dumplings, would typically be more of a noodle wrapper and filled with minced pork. So quite a bit different. Are you able to try Hong Kong dumplings where you’re living? Graeme Kemp (Aussie expat in Canada) 46 yr old. I just want to say Thankyou! I absolutely love watching your food trips, while I don’t travel much, your enthusiasm and joy with the places you go and the food you eat really make it as though I’m there with you. Your piece on Kobe and especially the Kobe beef really gave me joy and a need to try it…my mouth was watering as you were eating! Please keep doing what you and Ying are doing, you make a great team and a total pleasure to watch. Graeme Kemp (food blogger wannabe). Hi Graeme, great to hear from you, and thank you for your support, for watching our videos and reading our blogs. Glad we share a passion for food and travel! I’ve loved this series in Japan, although I’d probably knock down an old lady to get some of that tuna you were showing us. i don’t think there’s anything better than super fresh, amazing tuna sashimi. Did you find the food a bit bland, compared to your normal garlic and hot chilies? Other than wasabi/horseradish, was there much spice? Thanks for all the work you and Ying do on these videos and the blog. I get to travel with you, and that’s a wonderful thing. Hey Missy, thank you for the comment. Haha, yah I would agree with you and the fresh tuna. Because Japanese food is so focused on the natural and fresh ingredients, I really love it, even though many things don’t have all that much spice. But yes, after 2 weeks in Japan, I was definitely ready to start eating some spicy food. You were not kidding when you said a huge blog!! I wish I had this when I had my trip to Japan. Unfortunately it did not have any of the restaurants that I went to so I could not share the experience. But MY GAWD everything looks so tasty. Hey Dave, no problem, glad this brought back some food memories from Japan. Thank you very much for sharing! This is brilliant. I’m flying from NZ to Osaka in 2 days time and I have thoroughly enjoyed watching your videos on Osaka. Now I can go and check out some of these places too. Thanks Mark 🙂 Itadakimasu!! Hey Sam, thank you very much, and so cool to hear you’re going to Osaka in 2 days. How long will you be staying in Japan? Hi Uwe, glad you’ll be visiting Japan soon as well. Yes, I’m really hoping to be able to take a European trip soon in the future. I would love to visit Germany. Have a safe and great trip! Thank you very much Vina!